Arbuscular mycorrhiza (AM) symbioses contribute to global carbon cycles as plant hosts divert up to 20% of photosynthate to the obligate biotrophic fungi. Previous studies suggested carbohydrates as the only form of carbon transferred to the fungi. However, de novo fatty acid (FA) synthesis has not been observed in AM fungi in absence of the plant. In a forward genetic approach, we identified two Lotus japonicus mutants defective in AM-specific paralogs of lipid biosynthesis genes (KASI and GPAT6). These mutants perturb fungal development and accumulation of emblematic fungal 16:1ω5 FAs. Using isotopolog profiling we demonstrate that 13C patterns of fungal FAs recapitulate those of wild-type hosts, indicating cross-kingdom lipid transfer from plants to fungi. This transfer of labelled FAs was not observed for the AM-specific lipid biosynthesis mutants. Thus, growth and development of beneficial AM fungi is not only fueled by sugars but depends on lipid transfer from plant hosts. Most land plants are able to form partnerships with certain fungi – known as arbuscular mycorrhiza fungi – that live in the soil. These fungi supply the plant with mineral nutrients, especially phosphate and nitrogen, in return for receiving carbon-based food from the plant. To exchange nutrients, the fungi grow into the roots of the plant and form highly branched structures known as arbuscules inside plant cells. Due to the difficulties of studying this partnership, it has long been believed that plants only provide sugars to the fungus. However, it has recently been discovered that these fungi lack important genes required to make molecules known as fatty acids. Fatty acids are needed to make larger fat molecules that, among other things, store energy for the organism and form the membranes that surround each of its cells. Therefore, these results raise the possibility that the plant may provide the fungus with some of the fatty acids the fungus needs to grow. Keymer, Pimprikar et al. studied how arbuscules form in a plant known as Lotus japonicus, a close relative of peas and beans. The experiments identified a set of mutant L. japonicus plants that had problems forming arbuscules. These plants had mutations in several genes involved in fat production that are only active in plant cells containing arbuscules. Further experiments revealed that certain fat molecules that are found in fungi, but not plants, were present at much lower levels in samples from mutant plants colonized with the fungus, compared to samples from normal plants colonized with the fungus. This suggests that the fungi colonizing the mutant plants may be starved of fat molecules. Using a technique called stable isotope labelling it was possible to show that fatty acids made in normal plants can move into the colonizing fungus. The findings of Keymer, Pimprikar et al. provide evidence that the plant feeds the fungus not only with sugars but also with fat molecules. The next challenge will be to find out exactly how the fat molecules are transferred from the plant cell to the fungus. Many crop plants are able to form partnerships with arbuscular mycorrhizal fungi. Therefore, a better understanding of the role of fat molecules in these relationships may help to breed crop plants that, by providing more support to their fungal partner, may grow better in the field. Arbuscular mycorrhiza (AM) is a widespread symbiosis between most land plants and fungi of the Glomeromycota (Smith and Read, 2008). The fungi provide mineral nutrients to the plant. These nutrients are taken up from the soil and released inside root cortex cells at highly branched hyphal structures, the arbuscules (Javot et al., 2007). For efficient soil exploration, arbuscular mycorrhiza fungi (AMF) develop extended extraradical hyphal networks. Their growth requires a large amount of energy and carbon building blocks, which are transported mostly as lipid droplets and glycogen to the growing hyphal tips (Bago et al., 2002, 2003). AMF are obligate biotrophs, as they depend on carbon supply by their host (Smith and Read, 2008). In the past, detailed 13C-labeled tracer-based NMR studies demonstrated that hexose sugars are a major vehicle for carbon transfer from plants to fungi (Shachar-Hill et al., 1995). In addition, a fungal hexose transporter, with high transport activity for glucose is required for arbuscule development and quantitative root colonization as shown by host induced gene silencing (Helber et al., 2011), indicating the importance of hexose transfer for intra-radical fungal development. AMF store carbon mainly in the form of lipids (Trépanier et al., 2005). The predominant storage form is triacylglycerol (TAG) and the major proportion of FAs found in AMF is composed of 16:0 (palmitic acid), and of 16:1ω5 (palmitvaccenic acid). The latter is specific to AM fungi and certain bacteria and is frequently used as marker for the detection of AM fungi in soil (Graham et al., 1995; Bentivenga and Morton, 1996; Madan et al., 2002; Trépanier et al., 2005). Fungus-specific 16:1ω5 FAs are not exclusive to glycerolipids but also incorporated into membrane phospholipids (van Aarle and Olsson, 2003). Furthermore, 18:1ω7 and 20:1∂11 are considered specific for AMF but do not occur in all AMF species (Madan et al., 2002; Stumpe et al., 2005). It has long been assumed that AMF use sugars as precursors for lipid biosynthesis (Pfeffer et al., 1999). However, de novo biosynthesis of fungal fatty acids (FAs) was only observed inside colonized roots and not in extraradical mycelia or spores (Pfeffer et al., 1999; Trépanier et al., 2005). The authors concluded that AM fungi can produce FAs only inside the host. The hypothesis that plants directly provide lipids to the fungus could not be supported at that time (Trépanier et al., 2005), due to experimental limitations and the lack of appropriate plant mutants. However, recently available whole genome sequences of AMF have revealed that genes encoding multi-domain cytosolic FA synthase subunits, typically responsible for most of the de novo 16:0 FA synthesis in animals and fungi, are absent from the genomes of the model fungi Rhizophagus irregularis, Gigaspora margarita and Gigaspora rosea (Wewer et al., 2014; Ropars et al., 2016; Salvioli et al., 2016; Tang et al., 2016). Hence, AMF appear to be unable to synthesize sufficient amounts of 16:0 FAs, but their genomes do encode the enzymatic machinery for 16:0 FA elongation to higher chain length and for FA desaturation (Trépanier et al., 2005; Wewer et al., 2014). Development of fungal arbuscules is accompanied by activation of a cohort of lipid biosynthesis genes in arbuscocytes (arbuscule-containing plant cells) (Gaude et al., 2012a, 2012b). Furthermore, lipid producing plastids increase in numbers and together with other organelles such as the endoplasmic reticulum change their position and gather in the vicinity of the arbuscule (Lohse et al., 2005; Ivanov and Harrison, 2014), symptomatic of high metabolic activity to satisfy the high demands of arbscocytes for metabolites including lipids. 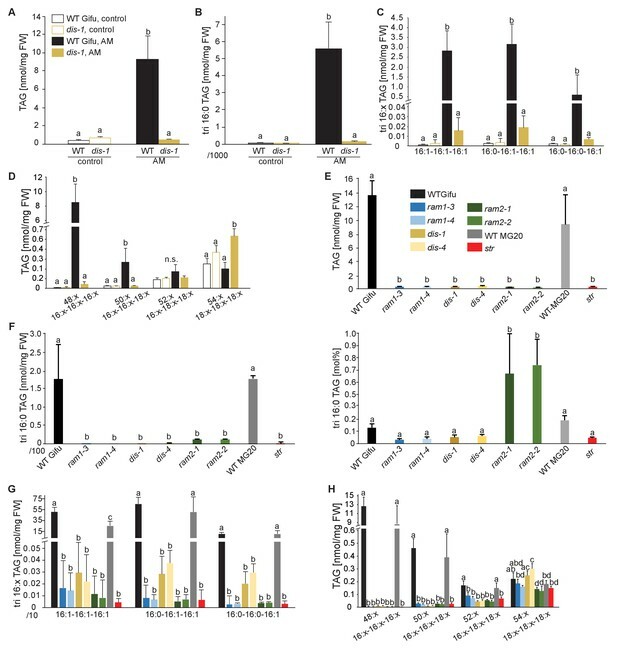 The importance of plant lipid biosynthesis for arbuscule development has been demonstrated by Medicago truncatula mutants in AM-specific paralogs of two lipid biosynthesis genes FatM and REDUCED ARBUSCULAR MYCORRHIZA2 (RAM2) (Wang et al., 2012; Bravo et al., 2017). FatM encodes an ACP-thioesterase, which terminates fatty acid chain elongation in the plastid by cleaving the ACP off the acyl group releasing free FAs and soluble ACP (Jones et al., 1995). RAM2 encodes a glycerol 3-phosphate acyl transferase (GPAT) and is most similar to Arabidopsis GPAT6. In Arabidopsis, GPAT6 acetylates the sn-2 position of glycerol-3-phosphate with an FA and cleaves the phosphate from lysophosphatidic acid, thereby producing sn-2-monoacylglycerol (ßMAG, Yang et al., 2010). Mutations in both FatM and RAM2 impair arbuscule branching (Wang et al., 2012; Bravo et al., 2017). In addition, arbuscule branching requires a complex of two half ABC transporters STR and STR2 (Zhang et al., 2010; Gutjahr et al., 2012). The substrate of STR/STR2 is unknown but other members of the ABCG transporter family are implicated in lipid transport (Wittenburg and Carey, 2002; Wang et al., 2011; Fabre et al., 2016; Hwang et al., 2016; Lee et al., 2016). Therefore, and due to its localization in the peri-arbuscular membrane (Zhang et al., 2010) it was speculated that the STR/STR2 complex may transport lipids towards arbuscules (Gutjahr et al., 2012; Bravo et al., 2017). Transcriptional activation of RAM2 and STR is controlled by the GRAS transcription factor REDUCED ARBUSCULAR MYCORRHIZA1 (RAM1) (Gobbato et al., 2012; Park et al., 2015; Pimprikar et al., 2016) and also in ram1 mutants, arbuscule branching is impaired (Park et al., 2015; Xue et al., 2015; Pimprikar et al., 2016). Thus, RAM1, FatM, RAM2 and STR/STR2 appear to form an AM-specific operational unit for lipid biosynthesis and transport in arbuscocytes. Consistently, they were found to be absent from genomes of plants that have lost the ability to form AM (Delaux et al., 2014; Favre et al., 2014; Bravo et al., 2016). Here, we analyzed two Lotus japonicus mutants identified in a forward genetic screen, which are impaired in arbuscule branching (Groth et al., 2013). Positional cloning combined with genome resequencing revealed mutations in a novel AM-specific β-keto-acyl ACP synthase I (KASI) gene and in the L. japonicus ortholog of M. truncatula RAM2. KASI likely acts upstream of RAM2 in producing 16:0 FAs. The identity of the genes and the phenotypes led us to hypothesize that AMF may depend on delivery of 16:0 FAs from the plant host. Using a combination of microscopic mutant characterization, lipidomics and isotopolog profiling of 16:0 and 16:1ω5 FAs in roots and extraradical fungal mycelium, we provide strong evidence for requirement of both genes for AM-specific lipid biosynthesis and cross-kingdom lipid transfer from plants to AMF. We previously identified two L. japonicus mutants disorganized arbuscules (dis-1, SL0154-N) and SL0181-N (red) deficient in arbuscule branching (Groth et al., 2013) (Figure 1A–B). Both mutants also suffered from a reduction in root length colonization and blocked the formation of lipid-containing vesicles of the fungus Rhizophagus irregularis (Figure 1C–D). We identified the causative mutations with a combination of classical mapping and next generation sequencing (see Materials and methods). DIS encodes a β-keto-acyl ACP synthase I (KASI, Figure 1—figure supplements 1A–C and 2). KASI enzymes catalyze successive condensation reactions during fatty acyl chain elongation from C4:0-ACP to C16:0-ACP (Li-Beisson et al., 2010). SL0181-N carries one mutation (ram2-1) in the L. japonicus orthologue of the previously identified Medicago truncatula REDUCED ARBUSCULAR MYCORRHIZA2 (RAM2, Figure 1—figure supplements 3 and 4). Arabidopsis GPAT6 has been shown to produce ß-MAG with a preference for 16:0 FAs (Yang et al., 2012). Therefore, we hypothesized that DIS and RAM2 act in the same biosynthetic pathway. DIS and RAM2 are required for arbuscule branching and vesicle formation. Arbuscule phenotype and complementation of dis (A) and ram2 (B) mutants. The fungus was stained with wheat-germ agglutinin (WGA)-AlexaFluor488. (C-D) Percent root length colonization of dis (C) and ram2 (D) mutants as compared to wild-type. Different letters indicate significant differences among treatments (ANOVA; posthoc Tukey). (C): n = 13; p≤0.1, F2,10 = 8.068 (total & int. hyphae); p≤0.001 F2,10 = 124.5 (arbuscules); p≤0.001, F2,10 = 299.1 (vesicles) (D): n = 15; p≤0.1, F2,12 = 10.18 (total & int. hyphae); p≤0.001 F2,12 = 57.86 (arbuscules); p≤0.001, F2,12 = 72.37 (vesicles). (A-D) Plants were inoculated with R. irregularis and harvested at 5 weeks post inoculation (wpi). We identified additional allelic dis mutants by TILLING (Figure 1—figure supplement 1E, Supplementary file 1) (Perry et al., 2003) and a ram2 mutant caused by a LORE1 insertion in the RAM2 gene (Figure 1—figure supplement 3B) (Małolepszy et al., 2016). Among the allelic dis mutants we chose dis-4 for further investigation because it suffers from a glycine replacement at the border of a conserved ß-sheet (Figure 1—figure supplement 2), which likely affects protein folding (Perry et al., 2009). Both allelic mutants dis-4 and ram2-2 phenocopied dis-1 and ram2-1, respectively. Furthermore, transgenic complementation of both dis-1 and ram2-1 with the wild-type versions of the mutated genes restored arbuscule-branching and wild-type-like levels of root length colonization and vesicle formation (Figure 1A-B). Taken together this confirmed identification of both causal mutations. Transcript levels of both DIS and RAM2 increased in colonized roots (Figure 3—figure supplement 1A). To analyze the spatial activity pattern of the DIS and RAM2 promoters during colonization we fused 1.5 kb for DIS and 2.275 kb for RAM2 upstream of the translational start site to the uidA gene. Consistent with a role of both genes in arbuscule development GUS activity was predominantly detected in arbuscocytes (arbuscule-containing cells) in both wild-type and the corresponding mutant roots (Figure 2—figure supplement 1A–B). To correlate promoter activity with the precise stage of arbuscule development we used nuclear localized YFP as a reporter. To visualize the fungus, the promoter:reporter cassette was co-transformed with a second expression cassette containing secreted mCherry fused to the SbtM1 promoter. This promoter drives expression in colonized cells, in cells neighboring apoplastically growing hyphae and in cells forming pre-penetration apparatuus (PPAs, cytoplasmic aggregations that assemble in cortex cells prior to arbuscule development) (Genre et al., 2008; Takeda et al., 2009, 2012). When expressed under the control of the SbtM1 promoter, secreted mCherry accumulates in the apoplast surrounding fungal structures and PPAs, thereby revealing the silhouette of these structures (Figure 2A–B, Videos 1–2). Nuclear localized YFP fluorescence indicated activity of both promoters in cells containing PPAs (c, Videos 1–2) and containing sparsely branched (d) or mature (e) arbuscules. Furthermore, we rarely detected YFP fluorescence in non-colonized cells in direct neighborhood of arbuscocytes, which were possibly preparing for PPA formation (a). However, YFP signal was absent from cells containing collapsed arbuscules (f), indicating that the promoters were active during arbuscule development and growth but inactive during arbuscule degeneration (Figure 2A–B). RAM2 promoter activity was strictly correlated with arbuscocytes, while the DIS promoter showed additional activity in cortical cells of non-colonized root segments (Figure 2A–B, Figure 2—figure supplement 1C–D, Videos 3–6). Arbuscocyte-specific expression of DIS and RAM2 is sufficient for arbuscule branching. Promoter activity indicated by nuclear localized yellow fluorescence in colonized transgenic L. japonicus wild-type roots transformed with constructs containing a 1.5 kb promoter fragment of DIS (A) or a 2.275 kb promoter fragment of RAM2 (B) fused to NLS-YFP. (A-B) Red fluorescence resulting from expression of pSbtM1:SP-mCherry labels the apoplastic space surrounding pre-penetration apparatuus (PPAs) and fungal structures, thereby evidencing the silhouette of these structures. a Colonized root, b non-colonized part of colonized root, c PPAs, (white arrow heads indicate the silhouette of fungal intraradical hyphae) d small arbuscules, e fully developed arbuscules f collapsed arbuscules. Merged confocal and bright field images of whole mount roots are shown. (C-D) Transgenic complementation of dis-1 (C) and ram2-1 (D) hairy roots with the respective wild-type gene driven by the PT4 promoter. The mutant gene was used as negative control. White arrowheads indicate arbuscules. (E-F) Quantification of AM colonization in transgenic roots shown in (C-D). Different letters indicate significant differences (ANOVA; posthoc Tukey; n = 15; p≤0.001) among genotypes for each fungal structure separately. Int. hyphae, intraradical hyphae. (E): F2,12 = 26.53 (total), F2,12 = 46.97 (arbuscules), F2,12 = 27.42 (vesicles). (F) F2,12 = 341.5 (total), F2,12 = 146.3 (arbuscules), F2,12 = 35.86 (vesicles). 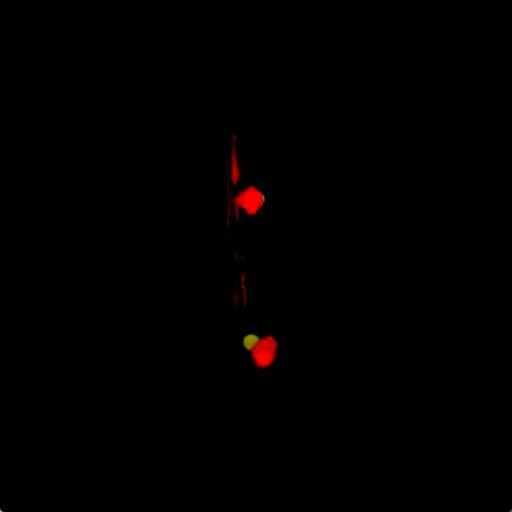 3D animation of Figure 2Ac illustrating that the silhouette of the fungal intraradical hyphae (red fluorescent vertical line) aligns with the silhouette of pre-penetration apparatuus (red fluorescent bag-like structure). Yellow fluorescence in nuclei indicates activation of pDIS:YFP. 3D animation of Figure 2Bc illustrating that the silhouette of the fungal intraradical hyphae (red fluorescent vertical line) aligns with the silhouette of pre-penetration apparatuus (red fluorescent bag-like structure). Yellow fluorescence in nuclei indicates activation of pRAM2:YFP. Scan through confocal z-stack of Figure 2Aa illustrating correlation of DIS promoter activity with arbuscocytes. Scan through confocal z-stack of Figure 2Ab illustrating DIS promoter activity exclusively in the cortex. Scan through confocal z-stack of Figure 2Ba illustrating correlation of RAM2 promoter activity with arbuscocytes. Scan through confocal z-stack of Figure 2Bb illustrating absence of RAM2 promoter activity from non-colonized cells. To examine, whether arbuscocyte-specific expression of DIS and RAM2 is sufficient for fungal development we complemented the dis-1 and ram2-1 mutants with the corresponding wild-type genes fused to the arbuscocyte-specific PT4 promoter (Volpe et al., 2013). This restored arbuscule-branching, vesicle formation as well as root length colonization in the mutants (Figure 2C–F), showing that arbuscocyte-specific expression of DIS and RAM2 suffices to support AM development. Thus, expression of lipid biosynthesis genes in arbuscocytes is not only important for arbuscule branching but also for vesicle formation and quantitative colonization. Growth and development of dis and ram2 mutants are not visibly affected (Figure 3—figure supplement 2), although they carry defects in important lipid biosynthesis genes. RAM2 is specific to AM-competent plants (Wang et al., 2012; Delaux et al., 2014; Favre et al., 2014; Bravo et al., 2016) and activated in an AM-dependent manner (Figure 2, Figure 3—figure supplement 1A) (Gobbato et al., 2012, 2013). Plants contain an additional GPAT6 paralog, which likely fulfills the housekeeping function (Figure 1—figure supplement 4, Yang et al., 2012; Delaux et al., 2015). To understand whether the same applies to DIS we searched the L. japonicus genome for additional KASI genes. We detected three paralogs KASI, DIS and DIS-LIKE (Figure 1—figure supplement 1D–E and Figure 1—figure supplement 2), of which only DIS was transcriptionally activated in AM roots (Figure 3—figure supplement 1A). Phylogenetic analysis revealed a split of seed plant KASI proteins into two different clades, called KASI and DIS (Figure 3). 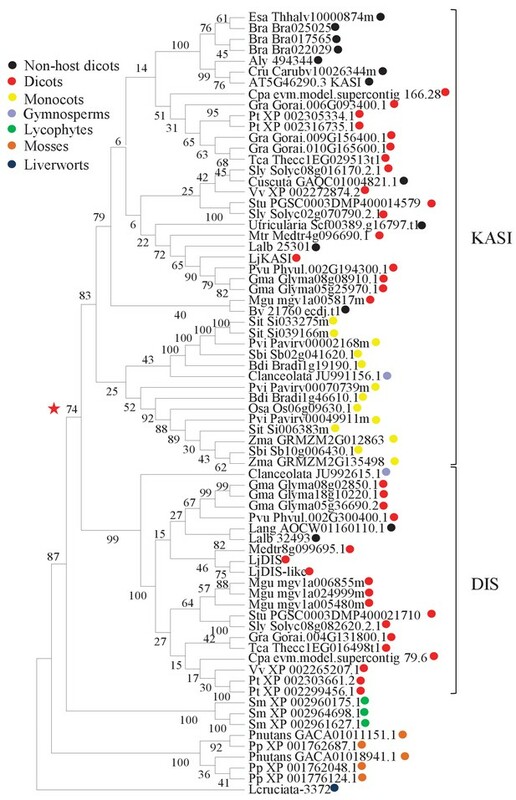 Members of the KASI clade, are presumably involved in housekeeping functions as this clade contains the product of the KASI single copy gene in Arabidopsis (Wu and Xue, 2010). Members of the DIS clade are found specifically in AM-host dicotyledons and in a gymnosperm (Figure 3). As confirmed by synteny analysis (Figure 3—figure supplement 3), DIS is absent from all eight analyzed non-host dicotyledon genomes, a phylogenetic pattern similar to other symbiosis genes (Delaux et al., 2014; Favre et al., 2014; Bravo et al., 2016). The occurrence of DIS in Lupinus species, which lost AM competence but still form root nodule symbiosis, may be a relic from the AM competent ancestor. An apparently, Lotus-specific, and thus recent duplication of the DIS gene resulted in an 87% identical copy (DIS-LIKE) located directly adjacent to DIS in a tail-to-tail orientation (Figure 1—figure supplements 1B–C, 2). DIS-LIKE was expressed at very low levels and not induced upon AM (Figure 3—figure supplement 1A). Nevertheless, because of its sequence similarity to DIS, we examined whether DIS-LIKE is also required for arbuscule formation using the dis-like-5 mutant, which suffers from a glycine replacement at position 180 at the border of a highly conserved β-sheet that likely affects protein function (Perry et al., 2009) (Supplementary file 1, Figure 1—figure supplement 2). However, in roots of dis-like-5 AM and arbuscule development was indistinguishable from wild type (Figure 3—figure supplement 1B). Therefore, DIS-LIKE might have lost its major role in arbuscule development after the duplication. Phylogenetic tree of KASI proteins in land plants. Protein sequences were aligned using MAFFT. Phylogenetic trees were generated by neighbor-joining implemented in MEGA5 (Tamura et al., 2011). Partial gap deletion (95%) was used together with the JTT substitution model. Bootstrap values were calculated using 500 replicates. DIS likely originated before the angiosperm divergence (red star). We examined whether DIS can substitute the phylogenetically related housekeeping KASI. To this end we transgenically complemented an Arabidopsis kasI mutant (Wu and Xue, 2010) with Lotus DIS driven by the Arabidopsis KASI promoter. Arabidopsis kasI exhibits an altered FA profile and reduced rosette growth (Wu and Xue, 2010). Complementation with DIS restored both wild-type-like rosette growth and FA accumulation. The kasI phenotypes persisted when the dis-1 mutant allele was transformed as a negative control (Figure 4C–E). In the reverse cross-species complementation AtKASI driven by the DIS promoter restored colonization, arbuscule branching and vesicle formation in dis-1 roots (Figure 4A–B). Furthermore, DIS contains a KASI-typical plastid transit peptide and - as predicted - localizes to plastids in Nicotiana benthamiana leaves and L. japonicus roots (Figure 1—figure supplement 1F Figure 4F–G). Thus, the enzymatic function of DIS is equivalent to the housekeeping KASI of Arabidopsis and the AM-specific function must result from its AM-dependent expression pattern. DIS function is equivalent to a canonical KASI. (A) Microscopic AM phenotype of transgenic dis-1 mutant and wild-type hairy roots transformed with either an empty vector (EV) or the Arabidopsis KASI gene fused to the L. japonicus DIS promoter. White arrowheads indicate arbuscules. (B) Quantification of AM colonization in transgenic roots of dis-1 transformed with EV (open circles), dis-1 transformed with pDIS-AtKASI (grey circles) and wild-type transformed with EV (black squares). int. hyphae, intraradical hyphae. Different letters indicate significant differences (ANOVA; posthoc Tukey; n = 15; p≤0.001) among genotypes for each fungal structure separately. F2,12 = 0.809 (total and intraradical hyphae), F2,12 = 43.65 (arbuscules), F2,12 = 0.0568 (vesicles). (C) Rosettes of Arabidopsis, kasI mutant, Col-0 wild-type plants and kasI mutant plants transformed either with the native AtKASI gene, the dis-1 mutant or the DIS wild-type gene driven by the Arabidopsis KASI promoter at 31 days post planting. (D) Rosette fresh weight of kasI mutant, Col-0 wild-type plants, one transgenic pAtKASI:AtKASI complementation line (Wu and Xue, 2010) and two independent transgenic lines each of kasI mutant plants transformed either with the dis-1 mutant or the DIS wild-type gene driven by the Arabidopsis KASI promoter at 31 days post planting. Different letters indicate significant differences (ANOVA; posthoc Tukey; n = 70; p≤0.001; F6,63 = 34.06) among genotypes. (E) Q-TOF MS/MS analysis of absolute amount of digalactosyldiacylglycerols (DGDG) containing acyl chains of 16:x + 18:x(34:x DGDG) or di18:x(36:x DGDG) derived from total leaf lipids of the different Arabidopsis lines. Different letters indicate significant differences (ANOVA; posthoc Tukey; n = 32; (p≤0.05, F 6,25 = 14.48 (36:6)). (F) Subcellular localization of DIS in transiently transformed Nicotiana benthamiana leaves. Free RFP localizes to the nucleus and cytoplasm (upper panel). RFP fused to DIS co-localizes with the Arabidopsis light harvesting complex protein AtLHCB1.3-GFP in chloroplasts (lower panel). 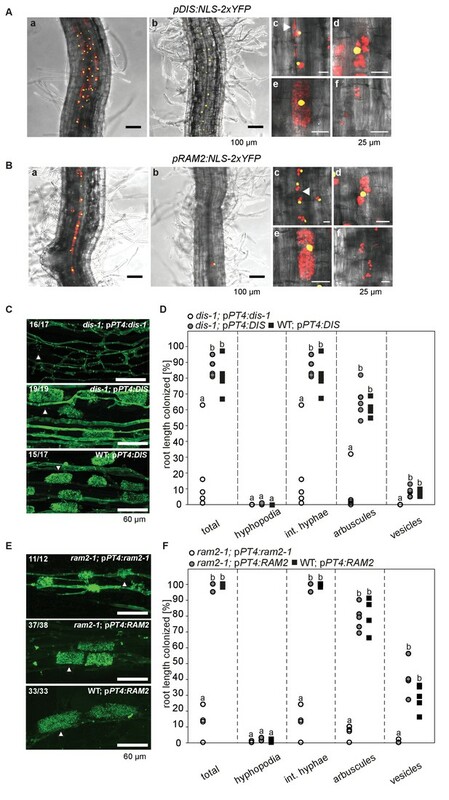 (G) Subcellular localization in plastids of DIS-YFP expressed under the control of the L. japonicus Ubiquitin promoter in R. irregularis colonized (upper panel) and non-colonized (lower panel) L. japonicus root cortex cells. BF, bright field; IH, intercellular hypha; A, arbuscule. To characterize the role of DIS in determining the lipid composition of non-colonized and colonized roots we quantified triacylglycerols (TAGs), diacylglycerols (DAGs), galactolipids and phospholipids in wild-type and dis-1. The lipid profile of colonized roots contains both plant and fungal lipids, however using the fungal marker FA 16:1ω5 and previous data on fungus-specific lipids (Wewer et al., 2014), many fungal lipids can be clearly distinguished from plant lipids. The lipid profile of non-colonized roots was not affected by the dis-1 mutation. However, the strong and significant increase of 16:0 and 16:1 (most probably fungus-specific 16:1ω5) containing TAGs, which is characteristic for colonization of wild-type roots (Wewer et al., 2014) was abolished in dis-1 (Figure 5A–D, Figure 5—figure supplement 1B). Also, AM- and fungus-specific DAG and phospholipid molecular species were enhanced in colonized wild-type roots but not in colonized dis-1 roots (Figure 5—figure supplements 1A and 2). In contrast, galactolipids were not affected by root colonization or genotype (Figure 5—figure supplement 3). In summary, DIS affects the glycerolipid and phospholipid profile of colonized L. japonicus roots and does not interfere with lipid accumulation in the non-colonized state. Most lipids affected by the DIS mutation are fungus-specific and therefore reflect the amount of root colonization and of fungal lipid-containing vesicles. However, since the root lipid profile is hardly affected, absence of FA elongation by DIS was the cause of reduced lipid accumulation and root colonization. Lack of characteristic accumulation of triacylglycerols in AM-defective mutants. (A-D) Quantitative accumulation of (A) total triacylglycerols, (B) tri16:0-triacylglycerol (C) tri16:x-triacylglycerols and (D) of triacylglycerols harbouring 16:x and 18:x FA-chains in non-colonized and R. irregularis colonized wild-type and dis-1 roots. Different letters indicate significant differences (ANOVA; posthoc Tukey) (A): n = 18; p≤0.001; F3,14 = 68.16. (B): n = 18; p≤0.001; F3,14 = 68.48. (C): n = 19; p≤0.01, F3,15 = 7.851 (16:1-16:1-16:1); p≤0.001, F3,15 = 14.52 (16:0-16:1-16:1); p≤0.001, F3,15 = 39.22 (16:0-16:0-16:1). (D): n = 19; p≤0.001, F3,15 = 12.15 (48:x), F3,15 = 15.56 (50:x); p≤0.01, F3,15 = 22.93 (54:x). (E-G) Quantitative accumulation of (E) total triacylglycerols, (F) tri16:0-triacylglycerols, (G) tri16:x-triacylglycerols and (H) of triacylglycerols harbouring 16:x and 18:x FA-chains in colonized roots of L. japonicus wild-type Gifu, wild-type MG-20 and arbuscule-defective mutants. Different letters indicate significant differences (ANOVA; posthoc Tukey). (E): n = 40; p≤0.001; F8,31 = 38.42. (F) Left: absolute tri16:0 TAG content: n = 40; p≤0.001; F8,31 = 19.05. Right: tri16:0 TAG proportion among all TAGs, n = 40; p≤0.001; F8,31 = 14.21. (G): p≤0.001; n = 41, F8,32 = 86.16 (16:1-16:1-16:1); n = 39, F8,30 = 24.16 (16:0-16:1-16:1); n = 40, F8,31 = 17.67 (16:0-16:0-16:1). (H): n = 40; p≤0.001, F8,31 = 39.26 (48:x), F8,31 = 28.93 (50:x); p≤0.01, F8,31 = 19.78 (52:x); p≤0.05, F8,31 = 13.77 (54:x). (A-H) Bars represent means ±standard deviation (SD) of 3–5 biological replicates. Similar to dis and ram2 L. japonicus mutants in the ABCG half-transporter STR and the GRAS protein RAM1 are affected in arbuscule branching (Kojima et al., 2014; Pimprikar et al., 2016; Xue et al., 2015), quantitative root colonization and formation of lipid-containing fungal vesicles (Figure 5—figure supplement 4). Moreover, the AM-dependent transcriptional activation of DIS and KASIII, the latter of which is a single copy gene in L. japonicus and produces precursors for DIS-activity by catalyzing FA chain elongation from C2 to C4, was absent from ram1 mutants (Figure 6). In contrast, induction of the single copy gene KASII, which elongates fatty acyl chains from C16 to C18 was not hampered by RAM1 deficiency. Thus, RAM1 may play an important role in the regulation of lipid biosynthesis in arbuscocytes, since it also mediates expression of RAM2 and STR (Gobbato et al., 2012; Park et al., 2015; Pimprikar et al., 2016; Luginbuehl et al., 2017). 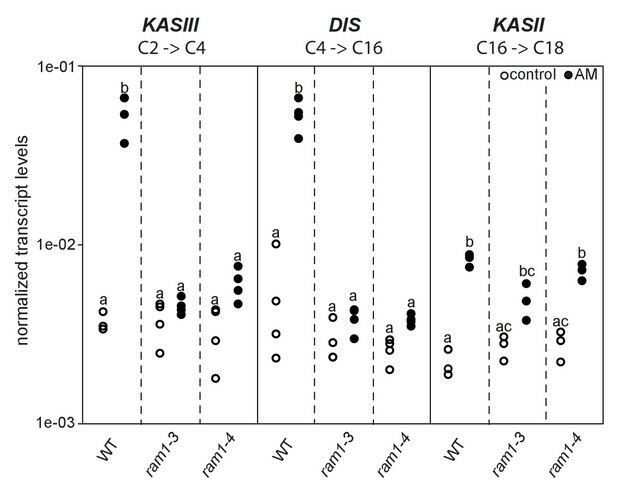 Loss of RAM1 affects AM-dependent induction of KASIII and DIS. (A) RAM1 effects on AM-dependent induction of KASIII and DIS, which catalyze 16:0 FA biosynthesis, and absence of effects on KASII. According to BLAST analysis via Kazusa (http://www.kazusa.or.jp/lotus/) and NCBI (http://www.ncbi.nlm.nih.gov/) KASIII and KASII are single copy genes in L.japonicus. Transcript accumulation of KASIII, DIS and KASII in non-colonized (open circles) and colonized (black circles) roots of Gifu WT, ram1-3 and ram1-4. Different letters indicate different statistical groups (ANOVA; posthoc Tukey; p≤0.001; n = 23 F5,12 = 65.04(KASIII); n = 24 F5,18 = 54.42 (DIS); n = 18 F5,12 = 33.11 (KASII)). Transcript accumulation was determined by qRT-PCR and the housekeeping gene Ubiquitin10 was used for normalization. AM plants were inoculated with R. irregularis and harvested 5 wpi. We hypothesized that RAM1, DIS, RAM2 and STR form a specific operational unit for lipid biosynthesis and transport in arbuscocytes. Therefore, we directly compared their impact on the AM-specific root lipid profile and measured galactolipids, phospholipids, TAGs and also total and free fatty acids in colonized roots of ram1, dis, ram2, str mutants and wild-type in parallel. 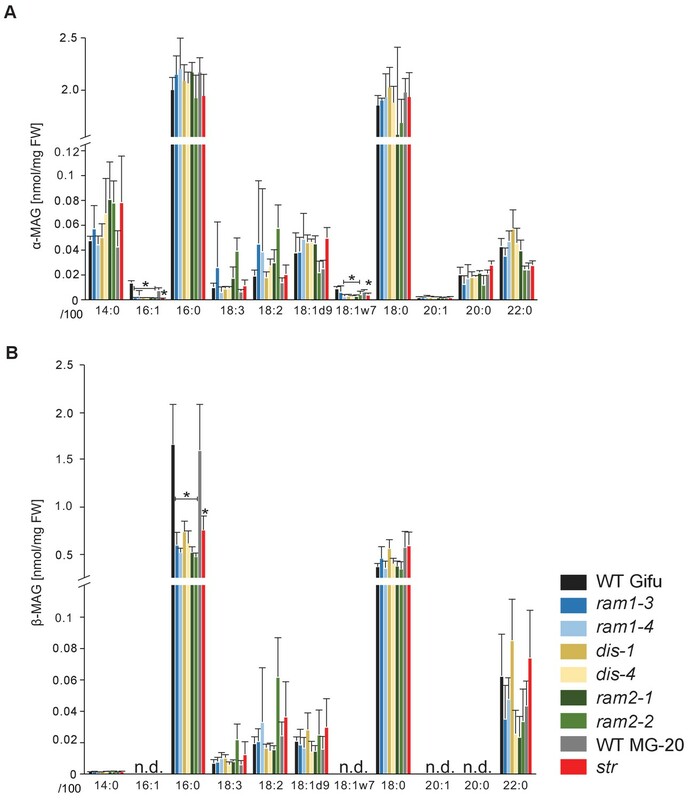 Consistent with our previous observation in dis-1, galactolipid accumulation was similar in colonized roots of wild-type and all mutants (Figure 5—figure supplement 3C–D). In contrast, total 16:0 FAs (FAMEs) as well as 16:1 and 18:1 (likely 18:1ω7 FA of fungal origin) FAs were strongly reduced in all colonized mutants compared to the corresponding wild-type. Free FAs showed a similar pattern except for 18:1 FAs (Figure 5—figure supplement 5). Also for TAGs and phospholipids, AMF-specific molecular species and 16:0 FA containing molecular species were strongly reduced in all mutants (Figure 5E–H, Figure 5—figure supplements 6–11). However, the two allelic ram2 mutants formed an exception. They specifically over-accumulated 16:0-16:0 FA-containing phospholipids in particular 32:0 PA and 32:0-PC but also to a smaller extend 32:0-PE and 32:0-PI (Figure 5—figure supplements 6–10). A similar pattern was observed for tri-16:0 TAGs (Figure 5F). This suggests that RAM2 acts downstream of DIS in a biosynthetic pathway and uses the 16:0 FAs synthesized by DIS in arbuscocytes as substrates. In the absence of functional RAM2 the FA products of DIS, are probably redirected into phospholipid biosynthesis and storage lipid biosynthesis via PA and PC (Li-Beisson et al., 2010) leading to the observed higher accumulation of 16:0 FA containing lipid species in ram2 mutants. This higher accumulation of specific lipids did not correlate with colonization levels in ram2 mutants (Figure 5—figure supplement 4) confirming that reduced colonization levels are not the primary cause for altered lipid profiles in the colonized mutant roots. Instead, defective AM-specific lipid biosynthesis in the mutants more likely impairs fungal development. The first step in TAG and phospholipid production after FA biosynthesis is the esterification of FAs with glycerol by GPATs in the plastid or endoplasmic reticulum to produce α-MAGs (sn1/3-MAGs, Li-Beisson et al., 2010). RAM2 is predicted to produce a different type of glycerolipid ß-MAG (sn2-MAG) with a preference towards 16:0 and 18:1 FAs (Yang et al., 2010; Wang et al., 2012; Yang et al., 2012). To examine the role of RAM2 in MAG biosynthesis, we quantified α-MAG and ß-MAG species in colonized roots of wild-type and all mutants. The abundance of ß-MAGs was generally lower than that of α-MAGs (Figure 7). The amount of most α-MAG species did not differ among the genotypes. Only the fungus-specific 16:1 and 18:1ω7 α-MAGs were reduced in all mutants reflecting the lower fungal biomass (Figure 7A). Fungus-specific ß-MAGs with 16:1 and 18:1ω7 acyl groups were not detected and most ß-MAG molecular species accumulated to similar levels in all genotypes. Exclusively the levels of 16:0 ß-MAGs were significantly lower in all mutants as compared to the corresponding wild-type roots (Figure 7B). This supports a role of RAM2 in 16:0 ß-MAG synthesis during AM and a role of DIS in providing 16:0 FA precursors for RAM2 activity. A low accumulation, of 16:0 ß-MAGs in ram1 mutants is consistent with RAM1’s role in regulating the FA and lipid biosynthesis genes (Figure 6) (Gobbato et al., 2012; Pimprikar et al., 2016). In str 16:0 ß-MAGs likely did not accumulate because of reduced RAM2 expression in str roots due to low root length colonization and/or a regulatory feedback loop (Bravo et al., 2017). sn-1 monoacylglycerol (α-MAG) and sn-2 monoacylglycerol (β-MAG) profiles of colonized L. japonicus wild-type and AM-defective mutant roots. (A) Total amounts of α-MAG molecular species in the different genotypes. (B) Total amounts of β-MAG molecular species in the different genotypes. 16:0 β-MAG levels are significantly reduced in all mutant lines compared to the respective wild-type. (A–B) Bars represent means ±standard deviation (SD) of 3–5 biological replicates. Black asterisk indicates significant difference of mutants vs. wild-type according to Student’s t-test, p<0.05. In plants, ß-MAGs serve as precursors for cutin polymers at the surface of aerial organs (Yang et al., 2012; Yeats et al., 2012). For their use in membrane or storage lipid biosynthesis they first need to be isomerized to α-MAGs (Li-Beisson et al., 2010). The recruitment of a GPAT6 (RAM2) instead of a α-MAG-producing GPAT for AM-specific lipid synthesis supports the idea that RAM2-products are destined for something else than membrane biosynthesis of the host cell. Since AM fungal genomes lack genes encoding cytosolic FA synthase subunits (Wewer et al., 2014; Ropars et al., 2016; Tang et al., 2016) we hypothesized that 16:0 ß-MAGs synthesized by DIS- and RAM2 are predominantly delivered to the fungus. To test this hypothesis, we examined lipid transfer by FA isotopolog profiling. Isotopologs are molecules that differ only in their isotopic composition. For isotopolog profiling an organism is fed with a heavy isotope labelled precursor metabolite. Subsequently the labelled isotopolog composition of metabolic products is analyzed. The resulting characteristic isotopolog pattern yields information about metabolic pathways and fluxes (Ahmed et al., 2014). We could not detect fungus-specific 16:1ω5 ß-MAGs in colonized roots (Figure 7B). Therefore, we reasoned that either a downstream metabolite of ß-MAG is transported to the fungus, or alternatively, ß-MAG is rapidly metabolized in the fungus prior to desaturation of the 16:0 acyl residue. Since the transported FA groups can be used by the fungus for synthesizing a number of different lipids, we focused on total 16:0 FA methyl esters (FAMEs, subsequently called FAs for simplicity) and 16:1ω1 FAMEs as markers for lipid transfer. We fed L. japonicus wild-type, dis-1, ram2-1 and str with [U-13C6]glucose and then measured the isotopolog composition of 16:0 FAs and 16:1ω5 FAs in L. japonicus roots and in associated extraradical fungal mycelium with spores. To generate sufficient hyphal material for our measurements the fungus was pre-grown on split Petri dishes in presence of a carrot hairy root system as nurse plant (Figure 8—figure supplement 1). Once the fungal mycelium had covered the plate, L. japonicus seedlings were added to the plate on the side opposing the carrot root. During the whole experiment, the fungus was simultaneously supported by the carrot hairy root and the L. japonicus seedling. Once the L. japonicus roots had been colonized, labelled glucose was added to the side containing L. japonicus. After an additional week, FAs were esterified and extracted from colonized L. japonicus roots and from the associated extraradical mycelium and the total amount of 13C labelled 16:0 and 16:1ω5 FAs as well as their isotopolog composition was determined. In L. japonicus wild-type 13C-labeled 16:0 and 16:1ω5 FAs were detected in colonized roots as well as in the extraradical fungal mycelium (Figure 8A–B, Figure 8—figure supplement 2A–B), indicating that 13C-labelled organic compounds were transferred from the root to the fungus. No labelled FAs were detected in the fungal mycelium when the fungus was supplied with [U-13C6]glucose in absence of a plant host (Figure 8A–B, Figure 8—figure supplements 2A–B,3), indicating that the fungus itself could not metabolize labelled glucose to synthesize FAs. The three mutants incorporated 13C into 16:0 FAs at similar amounts as the wild-type but hardly any 13C was transferred to the fungus (Figure 8A–B, Figure 8—figure supplement 2A–B). Isotopolog profiling indicates lipid transfer from plant to fungus. (A–B) Overall excess (o.e.) 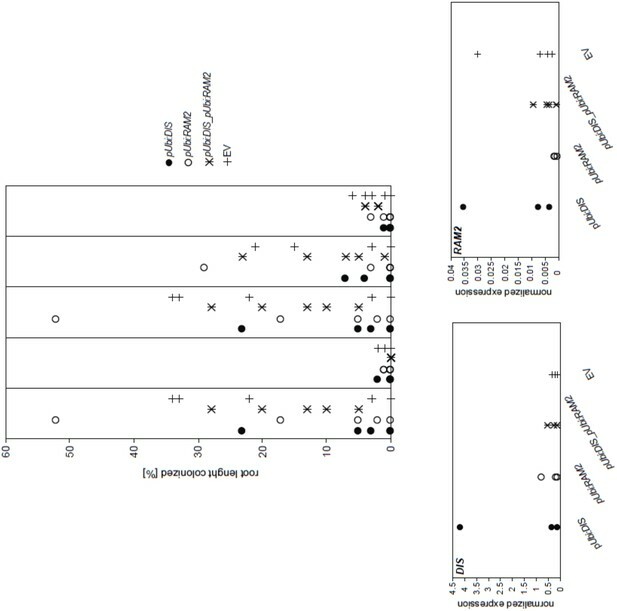 13C over air concentration in 16:0 FAs (A) and in 16:1ω5 FAs (B) detected in non-colonized (only 16:0 FAs) and colonized carrot, L. japonicus wild-type, dis-1, ram2-1 roots and in the extraradical mycelium of R. irregularis. P values were generated by ANOVA using the Dunnett Test for multiple comparisons to L. japonicus wild-type (n = 29 (16:0 control roots); n = 33 (16:0 root AM); n = 39 (16:0 extraradical mycelium); n = 33 (16:1ω5 root AM); n = 39 (16:1ω5 extraradical mycelium), ***p<0.001, **p<0.01, *p<0.05). (C) Relative fraction of 13C isotopologs for 16:0 FAs of three replicates of carrot, L. japonicus WT Gifu, dis-1, ram2-1 in control roots (upper panel) and AM roots and each of the associated R. irregularis extraradical mycelia with spores (middle panel) and 16:1ω5 FAs in AM roots and extraradical mycelia with spores (lower panel). Individual bars and double bars indicate individual samples. Values from roots are indicated by ‘R’ and from fungal extraradical mycelia with spores by ‘M’. For carrot and L. japonicus WT the 13C labelling pattern of 16:0 and 16:1ω5 FAs in the plant is recapitulated in the fungal extraradical mycelium. Extraradical mycelium associated with dis-1 and ram2-1 does not mirror these patterns. Compare bars for AM roots and extraradical mycelium side by side. Black numbers indicate 13C o. e. for individual samples. Colors indicate 13C-isotopologs carrying one, two, three, etc. 13C-atoms (M + 1, M + 2, M + 3, etc.). (D) Schematic and simplified illustration of carbon flow and 12C vs.13C-carbon contribution to plant lipid metabolism and transport to the fungus in the two-compartment cultivation setup used for isotope labelling. Carbohydrate metabolism and transport is omitted for simplicity. ERM, extraradical mycelium. Remarkably, the isotopolog profile of 16:0 FAs was close to identical between colonized L. japonicus roots and the connected extraradical mycelium, for 11 independent samples of wild-type Gifu (Figure 8C–D, Figure 8—figure supplement 4) and for 5 independent samples of wild-type MG20 (Figure 8—figure supplement 2C–D). Moreover, the isotopolog profile of fungus-specific 16:1ω5 FAs mirrored the profile of 16:0 FAs (Figure 8C, Figure 8—figure supplements 2,4). Pattern conservation between root and associated extraradical mycelium occurred independently of pattern variation among individual samples. Since the fungus does not incorporate 13C into the analyzed FAs in the absence of the plant (Figure 8A–B, Figure 8—figure supplement 2A–B) this conserved pattern demonstrates transfer of 16:0 FA-containing lipids from the host plant to the fungus because the plant determines the isotopolog pattern of fungal 16:0 and 16:1ω5 FAs. The 16:0 FA isotopolog pattern of colonized dis-1, ram2 and str mutant roots resembled the wild-type profile, indicating intact uptake and metabolism of labelled glucose. However, the 16:0 FA isotopolog pattern of the extraradical mycelium associated with mutant roots and the fungal 16:1ω5 FA profile inside and outside the roots differed strongly from the 16:0 FA profile of the mutant host roots (Figure 8C, Figure 8—figure supplements 2C,4), consistent with very low FA transfer from the mutant plants to the fungus. The losses in isotopolog profile conservation between plant and fungal FAs in the mutants likely result from dilution of labelled FAs by unlabeled FAs from the carrot hairy root (Figure 8D, Figure 8—figure supplements 1 and 2D) and/or from biases due to quantification of FAs at the detection limit. To confirm that the plant determines the fungal FA isotopolog pattern we switched plant system and profiled isotopologs after labelling carrot root organ culture (ROC) in the absence of L. japonicus seedlings (Figure 8D, Figure 8—figure supplement 1). In these root organ cultures, sugar uptake from the medium does not compete with photosynthesis, as in whole seedlings. Additionally, the carrot roots explore a larger surface of the Petri dish, increasing access to substances in the nutrient medium. Consequently, and likely because of increased uptake of labelled glucose from the medium, the isotopolog pattern of carrot ROCs differed from Lotus and was shifted towards more highly labeled 16:0 FA isotopologs. This fingerprint was again recapitulated in the extraradical fungal mycelium as well as in fungus-specific 16:1ω5 FAs inside and outside the root for 10 independent samples (Figure 8C, Figure 8—figure supplement 4). These data provide strong support for direct transfer of a 16:0 FA containing lipid from plants to AMF (Figure 9). Schematic representation of plant fatty acid and lipid biosynthesis in a non-colonized root cell and a root cell colonized by an arbuscule. In non-colonized cells FAs are synthesized in the plastid, bound via esterification to glycerol to produce LPA in the ER, where further lipid synthesis and modification take place. Upon arbuscule formation AM-specific FA and lipid biosynthesis genes encoding DIS, FatM and RAM2 are activated to synthesize specifically high amounts of 16:0 FAs and 16:0-ß-MAGs or further modified lipids (this work and Bravo et al., 2017). These are transported from the plant cell to the fungus. The PAM-localized ABCG transporter STR/STR2 is a hypothetical candidate for lipid transport across the PAM. Desaturation of 16:0 FAs by fungal enzymes (Wewer et al., 2014) leads to accumulation of lipids containing specific 16:1ω5 FAs. Mal-CoA, Malonyl-Coenzyme A; FA, fatty acid; KAS, β-keto-acyl ACP synthase; GPAT, Glycerol-3-phosphate acyl transferase; PAM, periarbuscular membrane; LPA, lysophosphatic acid; MAG, monoacylglycerol; DAG, diacylglycerol; TAG, triacylglycerol; PA, phosphatidic acid; PC, phosphatidylcholine; PE, phosphatidylethanolamine; PS, phosphatidylserine; CDP-DAG, cytidine diphosphate diacylglycerol; PG, phosphatidylglycerol; PI, phosphatidylinositol. Here we identified DIS and RAM2, two AM-specific paralogs of the lipid biosynthesis genes KASI and GPAT6 using forward genetics in Lotus japonicus. The dis and ram2 mutants enabled us to demonstrate lipid transfer from plants to AMF using isotopolog profiling. During AM symbiosis, an array of lipid biosynthesis genes is induced in arbuscocytes (Gaude et al., 2012a, 2012b), indicating a large demand for lipids in these cells. Indeed, two genes encoding lipid biosynthesis enzymes, the thioesterase FatM and the GPAT6 RAM2, have previously been shown to be required for arbuscule branching in M. truncatula (Wang et al., 2012; Bravo et al., 2017; Jiang et al., 2017). 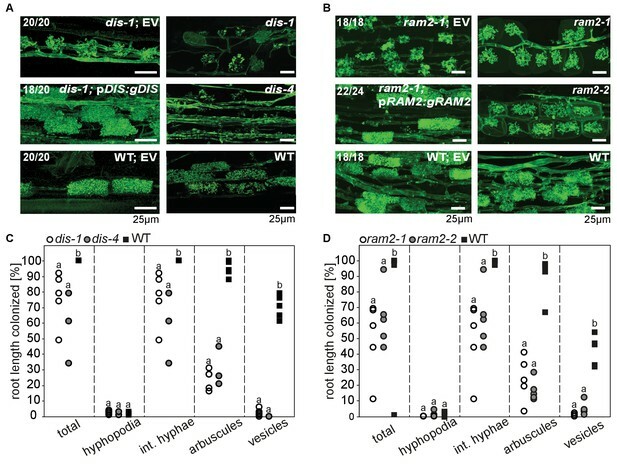 Both enzymes have a substrate preference for 16:0 FAs (Salas and Ohlrogge, 2002; Yang et al., 2012; Bravo et al., 2017) and, consistent with this, we and others observed that colonized ram2 mutant roots over-accumulate 16:0 FA containing phospholipids and TAGs (Figure 7, [Bravo et al., 2017]), indicating re-channeling of superfluous 16:0 FAs in the absence of RAM2 function and placing RAM2 downstream of FatM (Figure 9). Our discovery of DIS, a novel and AM-specific KASI gene, now provides evidence for the enzyme which synthesizes these 16:0 FAs in arbuscocytes. The arbuscule phenotype, as well as the lipid profile of colonized dis mutants is very similar to fatm and ram2 mutants except for the accumulation of 16:0 FA-containing lipids in ram2 (Figure 1, Figure 5 and all figure supplements), consistent with the predicted function. Together, this strongly suggests that DIS, FatM and RAM2 act in the same lipid biosynthesis pathway, which is specifically and cell-autonomously induced when a resting root cortex cell differentiates into an arbuscocyte (Figure 2A–B, Figure 9, [Bravo et al., 2017]). Interestingly, DIS was exclusively found in genomes of AM-competent dicotyledons and a gymnosperm (Figure 3). This implies that DIS has been lost at the split of the mono- from dicotyledons. Despite the phylogenetic divergence, DIS and the single copy housekeeping KASI gene of Arabidopsis are interchangeable (Figure 5). Therefore, the specificity of DIS to function in AM symbiosis is probably encoded in its promoter (Figure 2). In monocotyledons, the promoter of the housekeeping KASI gene may have acquired additional regulatory elements, sufficient for arbuscocyte-specific activation, thus making DIS dispensable. We provide several pieces of complementary evidence that lipids synthesized by DIS and RAM2 in the arbuscocyte are transferred from plants to AMF and are required for fungal development. We fed host plants with [U-13C6]glucose and subsequently determined the isotopolog profile of freshly synthetized 16:0 and 16:1ω5 FAs in roots and associated fungal extraradical mycelia (Figure 8). This showed that: (1) AMF were unable to incorporate 13C into FAs when fed with [U-13C6]glucose in absence of the host plant. (2) When associated with a wild-type host, the fungal extraradical mycelium accumulated 13C labelled 16:0 FAs and the isotopolog profile of these 16:0 FAs was almost identical with the host profile. (3) The 16:0 FA isotopolog fingerprint differed strongly between two different wild-type plant systems (Lotus seedling and carrot hairy root) but for each of them the fungal mycelium recapitulated the isotopolog profile. Therefore clearly, the plant dominates the profile of the fungus, because it is impossible that the fungus by itself generates the same FA isotopolog pattern as the plant – especially in the absence of cytosolic FA synthase. Therefore, this result provides compelling evidence for interkingdom transfer of 16:0 FAs from plants to AMF. 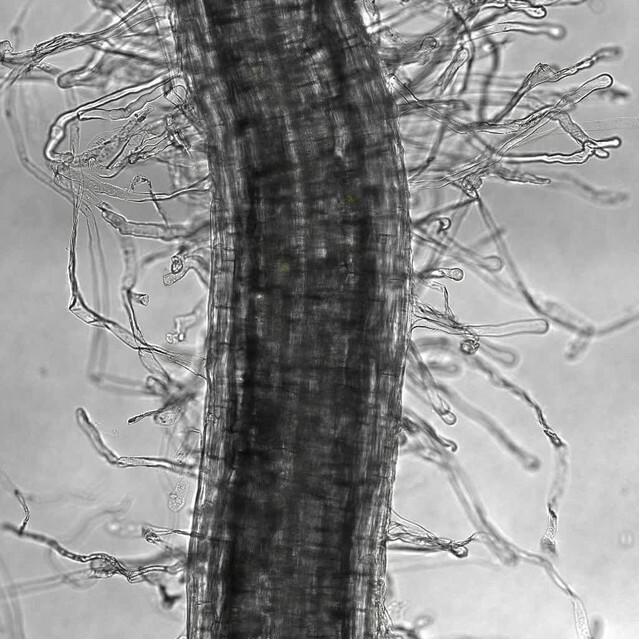 (4) In agreement, the isotopolog profile of fungus-specific 16:1 ω5 FAs inside and outside the root also resembled the plant 16:0 FA profile. (5) Colonized dis and ram2 mutant roots resembled the 16:0 FA isotopolog profile of L. japonicus wild-type roots. However, the 16:0 FA profile of the fungal extraradical mycelium and the 16:1ω5 FA profile inside the roots showed a very different pattern, consistent with very low transport of labelled FAs to the fungus when associated with the mutants. (6) DIS and RAM2 are specifically required for the synthesis of 16:0 ß-MAG (Figure 7) and the predominant FA chain length found in AM fungi is precisely 16. (7) dis and ram2 roots do not allow the formation of lipid-containing fungal vesicles and accumulate very low levels of fungal signature lipids (Figure 5 and figure supplements). Together this strongly supports the idea that DIS and RAM2 are required to provide lipids for transfer to the fungus. Consequently, in the mutants, the fungus is deprived of lipids. The L. japonicus mutants were originally identified due to their defective arbuscule branching (Groth et al., 2013). The promoters of DIS and RAM2 are active in arbusocytes and already during PPA formation, the earliest visible stage of arbuscocyte development. Together with the stunted arbuscule phenotype of dis, ram2 and fatm mutants (Figure 1 [Bravo et al., 2017]) this suggests that plant lipids are needed for arbuscule growth, probably to provide material for the extensive plasma-membrane of the highly branched fungal structure. It also indicates that the arbuscule dictates development of the AMF as a whole, since lipid uptake at the arbuscule is required for vesicle formation, full exploration of the root and development of extraradical mycelia and spores. Defective arbuscule development was also observed for the different and phylogenetically distantly related AMF Gigaspora rosea (Groth et al., 2013), which similar to R. irregularis lacks genes encoding cytosolic FA synthase from their genomes (Wewer et al., 2014; Tang et al., 2016). Hence the dependence on plant lipids delivered at the arbuscule is likely a common phenomenon among AMF and a hallmark of AMF obligate biotrophy. Despite the obvious central importance of lipid uptake by the arbuscule, the fungus can initially colonize the mutant roots with a low amount of intraradical hyphae and stunted arbuscules (Figure 1, Figure 5—figure supplement 4). The construction of membranes for this initial colonization may be supported by the large amounts of lipids stored in AMF spores. This would be consistent with the frequent observation that in wild-type roots, at initial stages of root colonization, AMF form arbuscules immediately after reaching the inner cortex and before colonizing longer distances, possibly as a strategy to accquire lipids quickly after the reserves in the spore have been depleted. Alternatively, it is possible that plant housekeeping enzymes provide lipids to intraradical hyphae before arbuscule formation. Activity of the housekeeping KASI may also be responsible for slightly higher colonization levels observed for dis in some experiments as compared to other mutants. 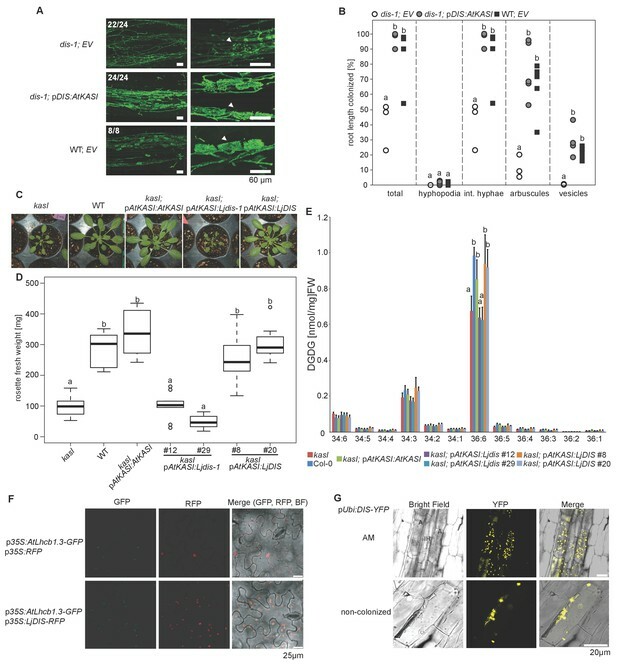 It has recently been reported that photosynthetic wild-type nurse plants can restore arbuscule-branching in Medicago ram2 and str mutants (Jiang et al., 2017; Luginbuehl et al., 2017), suggesting that lipids can be supplied to arbuscules via the extraradical hyphal network and intraradical hyphae through this route support arbuscule fine-branching. Based on four observations, we favor an alternative szenario, in which lipids need to be provided cell-autonomously by the arbuscocyte to support arbuscule fine-branching. However, we cannot exclude that our observations differ from the reported observations due to growth conditions or plant species. (1) Presence of nurse carrot hairy roots did not restore arbuscule branching in dis, ram2 and str (Figure 8—figure supplement 1C–F). (2) dis and ram2 were found in a forward genetics screen based on their stunted arbuscule phenotype. In this screen, the fungal inoculum was provided via chive nurse plants (Groth et al., 2013). (3) Map-based cloning of Lotus dis, ram2 and str (Kojima et al., 2014) was performed with segregating mutant populations grown in the same pot, in which the wild-type and heterozygeous siblings acted as nurse plants on the homozygeous mutants. In this system, the stunted arbuscule phenotype was easily observable. (4) Arbuscule branching in a rice str mutant was not restored by wild type nurse plants (Gutjahr et al., 2012). It still remains to be shown, which types of lipids are transported from the plant arbuscocyte to the fungal arbuscule and how. RAM2 is the most downstream acting enzyme in arbuscocyte-specific lipid biosynthesis known to date (Figure 9). It is predicted to synthesize ß-MAG and we and others have shown that 16:0 ß-MAGs are indeed reduced in colonized roots of dis, fatm and ram2 mutants, providing evidence that this is likely the case (Figure 7, [Bravo et al., 2017]). Although, we cannot exclude that a downstream metabolite of 16:0 ß-MAG is transported to the fungus, 16:0 ß-MAG as transport vehicle for 16:0 FAs to the fungus is a good candidate because conceptually this molecule may bear certain advantages. It has been shown in Arabidopsis that ß-MAGs are not used for plant storage or membrane lipid biosynthesis but rather as pre-cursors for cuticle formation (Li et al., 2007). The production of ß-MAGs could therefore, be a way, to withdraw FAs from the plants own metabolism to make them available to the fungus. In addition, ß-MAGs are small and amphiphilic and could diffuse across the short distance of the hydrophilic apoplastic space between plant and fungal membrane. At the newly growing arbuscule branches the distance between the plant and fungal membrane is indeed very small and has been measured to be 80–100 nm on TEM images of high-pressure freeze-substituted samples (Bonfante, 2001). However, we could not detect fungus-specific 16:1ω5 ß-MAGs in colonized roots. This could mean that the fungus metabolizes them before desaturation of the 16:0 FAs to synthesize membrane and storage lipids. Alternatively, ß-MAGs may not be taken up by the fungus. ß-MAGs are known to isomerize to α-MAGs in acid or basic conditions (Iqbal and Hussain, 2009). It is therefore, possible that they isomerize in the acidic periarbuscular space (Guttenberger, 2000) before being taken up by the arbuscule. How are MAGs transported across the peri-arbuscular membrane? Good candidates for MAG transporters are the ABCG half transporters STR and STR2. Similar ABCG transporters have been implicated genetically in cuticle formation, which also requires ß-MAGs (Pighin et al., 2004; Panikashvili et al., 2011; Yeats et al., 2012). The half ABCG transporters STR and STR2 are both independently required for arbuscule branching and they need to interact to form a full transporter (Zhang et al., 2010). We found that colonized roots of a L. japonicus str mutant, did not allow the formation of fungal vesicles and had the same lipid profile as dis and ram2 (Figure 5 and figure supplements). Furthermore, our 13C labelling experiment demonstrated that str mutants do not transfer lipids to the fungus (Figure 8—figure supplement 2). Although these are encouraging indications, strong evidence for the role of STR in lipid transport across the periarbuscular membrane is still lacking and the substrate of STR remains to be determined. Therefore, currently, it cannot be excluded that mutation of str has an indirect effect on lipid transport and alternative mechanisms for example lipid translocation via vesicle fission and fusion are possible. Nevertheless, also in AMF, several ABC transporter genes are expressed in planta (Tisserant et al., 2012; Tang et al., 2016). They are not characterized, but if lipid transport via ABC transporters instead of other mechanisms would play a role, some of them could be involved in uptake of lipids into the fungal cytoplasm. We found that mutants in the GRAS gene RAM1 are impaired in AM-specific lipid accumulation in colonized roots and in AM-mediated activation of DIS and the single copy gene KASIII (Figure 6), in addition to FatM, RAM2 and STR (Wang et al., 2012; Park et al., 2015; Pimprikar et al., 2016; Luginbuehl et al., 2017). This suggests that plants have evolved an AM-specific regulatory module for lipid production in arbuscocytes and delivery to the fungus. It remains to be shown, whether RAM1 regulates lipid biosynthesis genes directly and how this occurs mechanistically. Our finding that plants transfer lipids to AMF completely changes the previous view that the fungus receives only sugars from the plant (Pfeffer et al., 1999; Trépanier et al., 2005). It will now be interesting to determine the relative contributions of sugar and lipid transfer to AMF, and whether this may be a determinant of variation in root length colonization and extraradical mycelium formation depending on the plant-fungal genotype combination (Sawers et al., 2017). An interesting question refers to why AMF have lost the genes encoding cytosolic FA synthase to depend on the lipid biosynthesis machinery of the host. FA biosynthesis consumes more energy than biosynthesis of carbohydrates and organic carbon provided by the plant needs to be transported in fungal hyphae over long distances from the inside of the root to the extremities of the extraradical mycelium. Therefore, it is conceivable that supply of plant lipids to the fungus plus fungal lipid transport is more energy efficient for the symbiosis as a whole than fungal carbohydrate transport plus fungal lipid biosynthesis. Hence, inter-organismic lipid transfer followed by loss of fungal FA biosynthesis genes may have been selected for during evolution because it likely optimized the symbiosis for most rapid proliferation of extraradical mycelium, thus ensuring efficient mineral nutrient acquisition from the soil for supporting the plant host. Lipid transfer across kingdoms has also been observed in human parasites or symbiotic bacteria of insects (Caffaro and Boothroyd, 2011; Elwell et al., 2011; Herren et al., 2014). It will be interesting to learn whether this is a more widespread phenomenon among biotrophic inter-organismic interactions. Lotus japonicus ecotype Gifu wild-type, ram1-3, ram1-4, dis-1, dis-4, dis-like-5, ram2-1, ram2-2 and ecotype MG-20 wild-type and str mutant (kindly provided by Tomoko Kojima (NARO, Tochigi, Japan) seeds were scarified and surface sterilized with 1% NaClO. Imbibed seeds were germinated on 0.8% Bacto Agar (Difco) at 24°C for 10–14 days. Seedlings were cultivated in pots containing sand/vermiculite (2/1 vol.) as substrate. For colonization with Rhizophagus irregularis roots were inoculated with 500 spores (SYMPLANTA, Munich, Germany or Agronutrition, Toulouse, France) per plant. Plants were harvested 5 weeks post inoculation (wpi); except for dis-1 complementation in Figure 1A, which was harvested at 4 wpi. Arabidopsis thaliana seeds of Col-0 wild-type, kasI mutant in the Col-0 background and the transgenically complemented kasI mutant were surface sterilized with 70% EtOH +0.05% Tween 20% and 100% EtOH, germinated on MS-Medium for 48 hr at 4°C in the dark followed by 5–6 days at 22°C (8 hr light/dark). The L. japonicus dis mutant (line SL0154, [Groth et al., 2013]) resulting from an EMS mutagenesis program (Perry et al., 2003, 2009) was backcrossed to ecotype Gifu wild-type and outcrossed to the polymorphic mapping parent ecotype MG-20. The dis locus segregated as a recessive monogenic trait and was previously found to be linked to marker TM2249 on chromosome 4 (Groth et al., 2013). We confirmed the monogenic segregation as 26 of 110 individuals originating from the cross to MG-20 (χ2: P(3:1)=0.74) and 32 of 119 individuals originating from the cross to Gifu (χ2: P(3:1)=0.63) exhibited the mutant phenotype. To identify SL0154-specific mutations linked to the dis locus, we employed a genome re-sequencing strategy. Nuclear DNA of Gifu wild-type and the SL0154 mutant was subjected to paired end sequencing (2 × 100 bp) of a 300–500 bp insert library, on an Illumina Hi-Seq 2000 instrument resulting in between 16.7 and 19.5 Gigabases per sample, equivalent to roughly 35–41 fold coverage assuming a genome size of 470 Megabases. Reads were mapped to the reference genome of MG-20 v2.5 (Sato et al., 2008) and single nucleotide polymorphisms identified using CLC genomics workbench (CLC bio, Aarhus, Denmark). SL0154-specific SNPs were identified by subtracting Gifu/MG-20 from SL0154/MG-20 polymorphisms. 19 potentially EMS induced (11x G->A, 8x C->T) SNPs called consistently in all mapped reads from SL0514 but not in Gifu were identified between the markers TM0046/TM1545, the initial dis target region (Figure 1—figure supplement 1A. In a screen for recombination events flanking the dis locus, 63 mutants out of 254 total F2 individuals of a cross MG-20 x SL0154 were genotyped with markers flanking the dis locus (Figure 1—figure supplement 1B). Interrogating recombinant individuals with additional markers in the region narrowed down the target interval between TM2249 and BM2170 (2 cM according to markers; ca. 650 kb). In this interval, 3 SL0154-specific SNPs with typical EMS signature (G to A transition) remained, of which one was predicted to be located in exon 3 of CM0004.1640.r2 (reference position 40381558 in L. japonicus genome version 2.5; http://www.kazusa.or.jp/lotus/), a gene annotated as ketoacyl-(acyl carrier protein) synthase. This co-segregation together with phenotyping of one additional mutant allele obtained through TILLING (Supplementary file 1, [Perry et al., 2003, 2009]) as well as transgenic complementation (Figure 1A)) confirmed the identification of the mutation causing the dis phenotype of the SL0514 line. The two remaining mutations in the target region were located in a predicted intron of chr4.CM0004.1570.r2.a, a cyclin-like F-box protein (reference position: 40356684) and in a predicted intergenic region (reference position: 40364479). Untranslated regions of DIS and DIS-LIKE were determined using the Ambion FirstChoice RLM RACE kit according to manufacturer`s instructions (http://www.ambion.de/). DIS sequence information can be found under the NCBI accession number KX880396. The L. japonicus Gifu mutant reduced and degenerate arbuscules (red, line SL0181-N) resulting from an EMS mutagenesis (Perry et al., 2003, 2009) was outcrossed to the ecotype MG-20 and previously reported to segregate for two mutations, one on chromosome 1 and one on chromosome 6 (Groth et al., 2013). They were separated by segregation and the mutation on chromosome 1 was previously found in the GRAS transcription factor gene REDUCED ARBUSCULAR MYCORRHIZA 1 (RAM1) (Pimprikar et al., 2016). A plant from the F2 population, which showed wild-type phenotype but was heterozygous for the candidate interval on chromosome 6 and homozygous Gifu for the candidate interval on chromosome 1 was selfed for producing an F3. The F3 generation segregated for only one mutation as 38 out of 132 individuals exhibited the mutant phenotype (χ2: P(3:1)=0.68). A plant from the F3 population, which displayed wild-type phenotype but was heterozygous for the candidate interval on chromosome 6 was selfed for producing an F4. The F4 generation also segregated for only one mutation as 17 out of 87 individuals exhibited the mutant phenotype (χ2: P(3:1)=0.76). To identify the mutation on chromosome 6 linked to the previously identified interval (Groth et al., 2013), we employed additional markers for fine mapping in F3 segregating and F4 mutant populations. This positioned the causative mutation between TM0082 and TM0302 (Figure 1—figure supplement 3A). Due to a suppression of recombination in this interval we could not get closer to the mutation and also next generation sequencing (see [Pimprikar et al., 2016] for the methodology) failed to identify a causative mutation. The Medicago truncatula ram2 mutant displays stunted arbuscules similar to our mutant (Wang et al., 2012). L. japonicus RAM2 had not been linked to any chromosome but was placed on chromosome 0, which prevented identification of a RAM2 mutation in the target interval on chromosome 6. Therefore, we sequenced the RAM2 gene by Sanger sequencing. Indeed, mutants with stunted arbuscule phenotype in the F3 and F4 generation carried an EMS mutation at base 1663 from G to A leading to amino acid change from Glycine to Glutamic acid, which co-segregated with the mutant phenotype (Figure 1—figure supplement 3B-C). An additional allelic mutant ram2-2 (Figure 1—figure supplement 3B) caused by a LORE1 retrotransposon insertion (Małolepszy et al., 2016) and transgenic complementation with the wild-type RAM2 gene confirmed that the causative mutation affects RAM2 (Figure 1B). Untranslated regions of RAM2 were determined using the Ambion FirstChoice(R) RLM RACE kit according to manufacturer’s instructions (http://www.ambion.de/). A 1345 bp long sequence upstream of ATG was available from the http://www.kazusa.or.jp/lotus/blast.html. To enable cloning a 2275 bp promoter fragment upstream of ATG of RAM2 the remaining upstream sequence of 1047 bp was determined by primer walking on TAC Lj T46c08. L. japonicus RAM2 sequence information can be found under the NCBI accession number KX823334 and the promoter sequence under the number KX823335. Genes and promoter regions were amplified using Phusion PCR according to standard protocols and using primers indicated in Supplementary file 2. Plasmids were constructed as indicated in Supplementary file 3. For localization of DIS in L. japonicus hairy roots the LIII tricolor plasmid (Binder et al., 2014) was used. The plasmid containing 35S:RFP for localization of free RFP in Nicotiana benthamiana leaves was taken from Yano et al. (2008). Hypocotyls of L. japonicus were transformed with plasmids shown in Supplementary file 3 for hairy root induction using transgenic Agrobacterium rhizogenes AR1193 as described (Takeda et al., 2009). Five plants per pot were sown. One week before transformation the primary bolt was cut off to induce growth of secondary floral bolts. 5 ml LB culture of A. tumefaciens transformed with a binary vector was incubated at 28°C, 300 rpm over night. 500 μl of the preculture was added to 250 μl LB medium with appropriate antibiotics. This culture was incubated again at 28°C, 300 rpm over night until an OD600 of 1.5 was reached. Plants were watered and covered by plastic bags the day before the dipping to ensure high humidity. The cells were harvested by centrifugation (10 min, 5000 rpm) and resuspended in infiltration medium (0.5 x MS medium, 5% sucrose). The resuspended cell culture was transferred to a box and Silwet L-77 was added (75 μl to 250 ml medium). The floral bolts of the plants were dipped into the medium for 5 s and put back into plastic bags and left in horizontal position for one night. After that, plants were turned upright, bags were opened and mature siliques were harvested. For rosette growth assays T3 plants were used. 31 days post sowing the rosettes were photographed and then cut and dried in an oven at 65°C for the determination of rosette dry weight. For promoter:GUS analysis L. japonicus hairy roots transformed with plasmids containing the DIS and RAM2 promoter fused to the uidA gene and colonized by R. irregularis were subjected to GUS staining as described (Takeda et al., 2009). To correlate DIS and RAM2 promoter activity precisely with the stage of arbuscule development two expression cassettes were combined in the same golden gate plasmid for simultaneous visualization of arbuscule stages and promoter activity. The fungal silhouette including all stages of arbuscule development and pre-penetration apparatuus were made visible by expressing secretion peptide coupled mCherry under the control of the SbtM1 promoter region comprising 704 bp upstream of the SbtM1 gene (Takeda et al., 2009). Promoter activity was visualized using a YFP reporter fused to a nuclear localization signal (NLS). N. benthamiana leaves were transiently transformed by infiltration of transgenic A. tumefaciens AGL1 as described (Yano et al., 2008). For analysis of transcript levels, plant tissues were rapidly shock frozen in liquid nitrogen. RNA was extracted using the Spectrum Plant Total RNA Kit (www.sigmaaldrich.com). The RNA was treated with Invitrogen DNAse I amp. grade (www.invitrogen.com) and tested for purity by PCR. cDNA synthesis was performed with 500 ng RNA using the Superscript III kit (www.invitrogen.com). qRT-PCR was performed with GoTaq G2 DNA polymerase (Promega), 5 x colorless GoTaq Buffer (Promega) and SYBR Green I (Invitrogen S7563, 10.000x concentrated, 500 µl) - diluted to 100x in DMSO. Primers (Supplementary file 2) were designed with primer3 (58). The qPCR reaction was run on an iCycler (Biorad, www.bio-rad.com/) according to manufacturer’s instructions. Thermal cycler conditions were: 95°C 2 min, 45 cycles of 95°C 30 s, 60°C/62°C 30 s and 72°C 20 s followed by dissociation curve analysis. Expression levels were calculated according to the ΔΔCt method (Rozen and Skaletsky, 2000). For each genotype and treatment three to four biological replicates were tested and each sample was represented by two to three technical replicates. L. japonicus KASI, DIS, DIS-LIKE, RAM2, Lj1g3v2301880.1 (GPAT6) protein sequences were retrieved from Lotus genome V2.5 and V3.0 respectively (http://www.kazusa.or.jp/lotus/) and A. thaliana KASI, E. coli KASI, E. coli KASII, M. truncatula RAM2 and Medtr7g067380 (GPAT6) were obtained from NCBI (http://www.ncbi.nlm.nih.gov). The sequences from L. japonicus were confirmed with a genome generated by next generation sequencing in house. Protein alignment for DIS was performed by CLC Main Workbench (CLC bio, Aarhus, Denmark). The Target Peptide was predicted using TargetP 1.0 Server (www.cbs.dtu.dk/services/TargetP-1.0/). RAM2 Protein alignment was performed by MEGA7 using ClustalW. The percentage identity matrix was obtained by Clustal Omega (http://www.ebi.ac.uk/Tools/msa/clustalo/). To collect sequences for phylogeny construction corresponding to potential DIS orthologs, Lotus DIS and KASI (outgroup) protein sequences were searched in genome and transcriptome datasets using BLASTp and tBLASTn respectively. The list of species and the databases used are indicated in Figure 3—source data 1. Hits with an e-value >10−50 were selected for the phylogenetic analysis. Collected sequences were aligned using MAFFT (http://mafft.cbrc.jp/alignment/server/) and the alignment manually checked with Bioedit. Phylogenetic trees were generated by Neighbor-joining implemented in MEGA5 (Tamura et al., 2011). Partial gap deletion (95%) was used together with the JTT substitution model. Bootstrap values were calculated using 500 replicates. A ~200 kb sized region in the L. japonicus genome containing the DIS locus (CM00041640.r2.a) was compared to the syntenic region in A. thaliana (Col-0) using CoGe Gevo (https://genomevolution.org/CoGe/GEvo.pl - (Lyons et al., 2008) as described in Delaux et al. (2014). Loci encompassing DIS orthologs from Medicago truncatula, Populus trichocarpa, Carica papaya, Phaseolus vulgaris and Solanum lycopersicum were added as controls. 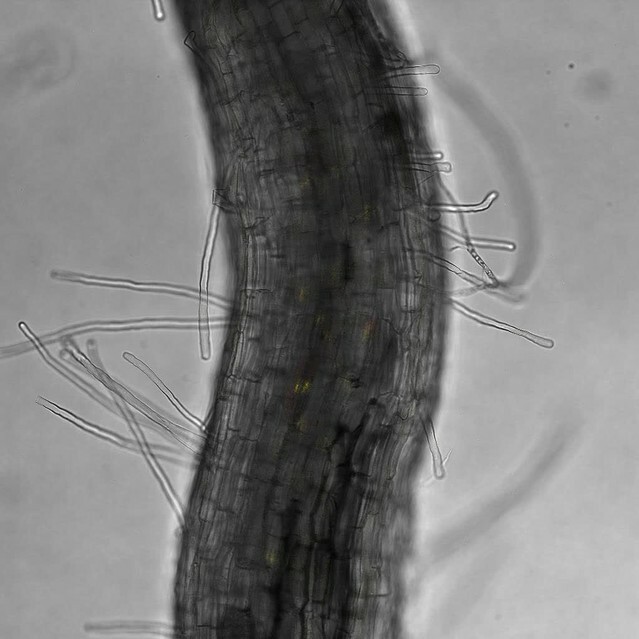 Rhizophagus irregularis in colonized L. japonicus roots was stained with acid ink (Vierheilig et al., 1998). 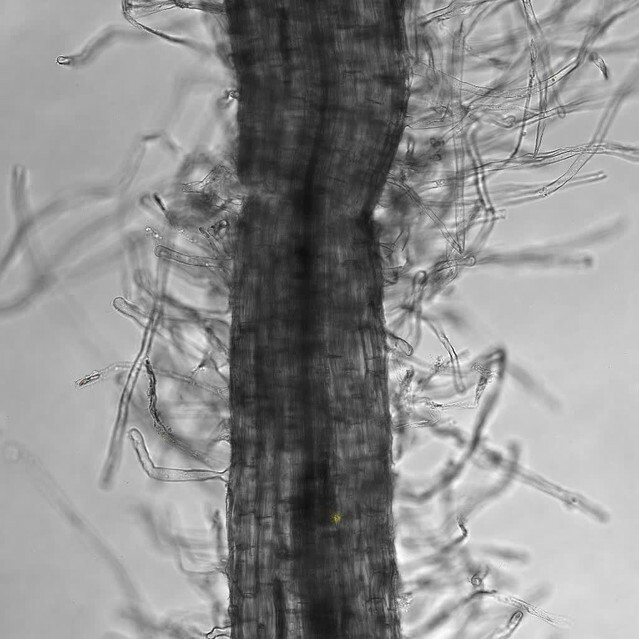 Root length colonization was quantified using a modified gridline intersect method (McGonigle et al., 1990). 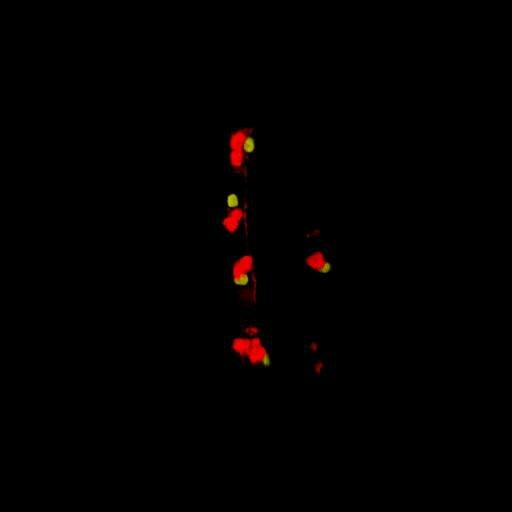 For confocal laser scanning microscopy (CLSM) fungal structures were stained with 1 μg WGA Alexa Fluor 488 (Molecular Probes, http://www.lifetechnologies.com/) (Panchuk-Voloshina et al., 1999). For quantification of AM colonization in L. japonicus roots a light microscope (Leica) with a 20x magnification was used. For observation of GUS-staining in L. japonicus hairy roots an inverted microscope (Leica DMI6000 B) was used with 10x and 20x magnification. Transformed roots were screened by stereomicroscope (Leica MZ16 FA) using an mCherry fluorescent transformation marker or the pSbtM1:mCherry marker for fungal colonization (for Figure 2A and B). Confocal microscopy (Leica SP5) for WGA-AlexaFluor488 detection using 20x and 63x magnification was performed as described (Groth et al., 2010). 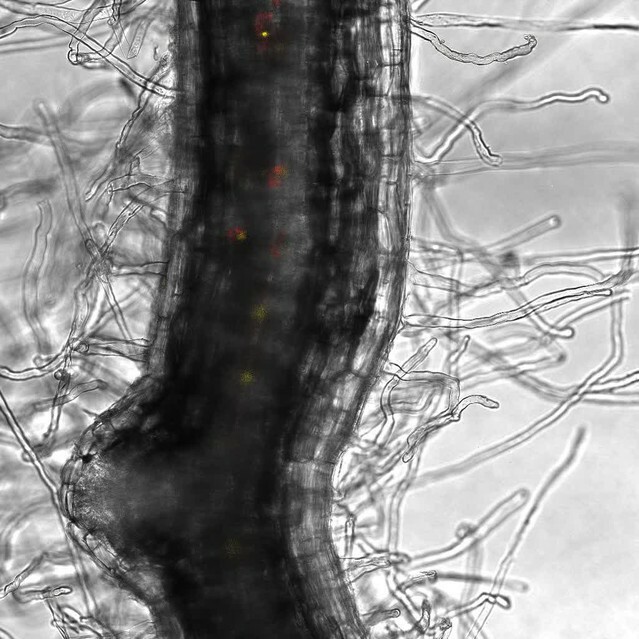 Transgenic roots showing mCherry fluorescence signal due to SbtM1 promoter activity linked with fungal colonization were cut into pieces immediately after harvesting. The living root pieces were placed on a glass slide with a drop of water, covered by a cover slip and immediately subjected to imaging. Sequential scanning for the YFP and RFP signal was carried out simultaneously with bright field image acquisition. YFP was excited with the argon ion laser 514 nm and the emitted fluorescence was detected from 525 to 575 nm; RFP was excited with the Diode-Pumped Solid State laser at 561 nm and the emitted fluorescence was detected from 580 to 623 nm. Images were acquired using LAS AF software. Several z-optical sections were made per area of interest and assembled to a z-stack using Fiji. The z-stack movies and 3D projections were produced using the 3D viewer function in Fiji (Schindelin et al., 2012). Approximately 50–100 mg of root or leaf material was harvested, weighed and immediately frozen in liquid nitrogen to avoid lipid degradation. The frozen samples were ground to a fine powder before extraction with organic solvents. Total lipids were extracted as described previously (Wewer et al., 2011, 2014). Briefly, 1 mL chloroform/methanol/formic acid (1:1:0.1, v/v/v) was added and the sample was shaken vigorously. At this point the internal standards for TAG and fatty acid analysis were added. Phase separation was achieved after addition of 0.5 mL 1M KCl/0.2 M H3PO4 and subsequent centrifugation at 4000 rpm for 5 min. The lipid-containing chloroform phase was transferred to a fresh glass tube and the sample was re-extracted twice with chloroform. The combined chloroform phases were dried under a stream of air and lipids were re-dissolved in 1 mL chloroform to yield the total lipid extract. For phospho- and glycerolipid analysis 20 µl of the total lipid extract were mixed with 20 µl of the internal standard mix and 160 µl of methanol/chloroform/300 mM ammonium acetate (665:300:35, v/v/v) (Welti et al., 2002). For triacylglycerol analysis 500 µl of the total lipid extract were purified by solid phase extraction on Strata silica columns (1 ml bed volume; Phenomenex) as described (Wewer et al., 2011). TAGs were eluted from the silica material with chloroform, dried under a stream of air and re-dissolved in 1 mL methanol/chloroform/300 mM ammonium acetate (665:300:35, v/v/v). Total lipids were extracted into chloroform and dried as described above. 15–0 FA and a mixture of 15–0 α-MAG and β-MAG were added as internal standard before the extraction. Dried extracts were resuspended in 1 ml n-hexane and applied to silica columns for solid-phase extraction with a n-hexane:diethylether gradient. Free fatty acids were eluted with a mixture of 92:8 (v/v) n-hexane:diethylether as described bevore (Gasulla et al., 2013) and pure diethylether were used for elution of MAG. For measurement of total fatty acids, 100 μl of the total lipid extract were used. For measurement of free fatty acids, the SPE-fraction containing free fatty acids was used. Fatty acid methyl esters (FAMEs) were generated from acyl groups of total lipids and free fatty acids by addition of 1 mL 1N methanolic HCL (Sigma) to dried extracts and incubation at 80°C for 30 min (Browse et al., 1986). Subsequently, FAMEs were extracted by addition of 1 mL n-hexane and 1 mL of 0.9% (w/v) NaCl and analyzed on a gas chromatograph with flame-ionization detector (GC-FID, Agilent 7890A PlusGC). FAMEs were separated on an SP 2380 fused silica GC column (Supelco, 30 mx 0.53 mm, 0.20 μm film) as described (Wewer et al., 2013), with a temperature -gradient starting at 100°C, increased to 160°C with 25°C/min, then to 220°C with10°C/min and reduced to 100°C with 25 °C/min. FAMEs were quantified in relation to the internal standard pentadecanoic acid (15:0). For MAG measurement, dried diethylether fractions were resuspended in 4:1 (v/v %) pyridine:N-Methyl-N-(trimethylsilyl)trifluoroacetamide (MSTFA), incubated at 80°C for 30 min, dried and re-suspended in hexane prior to application on an Agilent 7890A Plus gas chromatography-mass spectrometer. MAGs were quantified by extracted ion monitoring, using [M+ - 103] for α-MAGs and [M+ - 161] for β-MAGs as previously reported for 16:0 MAG (Destaillats et al., 2010) and 24:0 MAG (Li et al., 2007). Phosphoglycerolipids (PC, PE, PG, PI, PS), glycoglycerolipids (MGDG, DGDG, SQDG) and triacylglycerol (TAG) were analyzed in positive mode by direct infusion nanospray Q-TOF MS/MS on an Agilent 6530 Q-TOF instrument as described previously (Lippold et al., 2012; Gasulla et al., 2013). A continuous flow of 1 µl/min methanol/chloroform/300 mM ammonium acetate (665:300:35, v/v/v) (Welti et al., 2002) was achieved using a nanospray infusion ion source (HPLC/chip MS 1200 with infusion chip). Data are displayed as X:Y, where X gives the number of C atoms of the fatty acid chain and Y the amount of desaturated carbo-carbon bonds inside that fatty acid chain. Internal standards for phospho- and glycoglycerolipid analysis were prepared as described previously (Gasulla et al., 2013; Wewer et al., 2014). The following standards were dissolved in 20 µl of chloroform/methanol (2:1, v/v): 0.2 nmol of each di14:0-PC, di20:0-PC, di14:0-PE, di20:0-PE, di14:0 PG, di20:0 PG, di14:0 PA and di20:0 PA; 0.03 nmol of di14:0-PS and di20:0-PS; 0.3 nmol of 34:0-PI; 0.15 nmol of 34:0-MGDG, 0.10 nmol of 36:0-MGDG; 0.2 nmol of 34:0-DGDG, 0.39 nmol of 36:0 DGDG and 0.4 nmol of 34:0 SQDG. 1 nmol each of tridecanoin (tri-10:0) and triundecenoin (tri-11:1), and 2 nmol each of triarachidin (tri-20:0) and trierucin (tri22:1) were used as internal standards for TAG quantification (Lippold et al., 2012). For quantification of total fatty acids and free fatty acids 5 µg of pentadecanoic acid (FA 15:0) was added to the samples (Wewer et al., 2013). The method for cultivation and stable isotope labelling of Lotus japonicus and Daucus carota hairy roots as well as for isotopolog profiling are described in more detail at Bio-protocol (Keymer et al., 2018). To determine lipid transfer from L. japonicus to the fungus we used the carrot root organ culture system (Bécard et al., 1988) to obtain sufficient amounts of fungal material for isotopolog profiling. (On petri dishes this was not possible with L. japonicus and in particular the lipid mutants alone). One compartment (carrot compartment) of the 2- compartmented petri dish system (Trépanier et al., 2005) was filled with MSR-medium (3% gelrite) containing 10% sucrose to support the shoot-less carrot root, and the other compartment (Lotus compartment) was filled with MSR-medium (3% gelrite) without sucrose. ﻿Ri T-DNA transformed Daucus carota hairy roots were placed in the carrot compartment. 1 week later, roots were inoculated with R. irregularis. Petri dishes were incubated at constant darkness and 30°C. Within 5 weeks R. irregularis colonized the carrot roots and its extraradical mycelium spread over both compartments of the petri dish and formed spores. At this stage two 2 week old L. japonicus seedlings (WT, dis-1, ram2-1) were placed into the Lotus compartment (Figure 8—figure supplement 1). The plates were incubated at 24°C (16 hr light/8 hr dark). To keep the fungus and root in the dark the petri dishes were covered with black paper. 3 weeks after Lotus seedlings were placed into the petri dish [U-13C6]glucose (100 mg diluted in 2 ml MSR-medium) (Sigma-Aldrich) was added to the Lotus compartment. Therefore, only Lotus roots but not the carrot roots took up label. For transfer experiments with carrot roots no Lotus plant was placed into the Lotus compartment and the [U-13C6]glucose was added to the carrot compartment. 1 week after addition of [U-13C6]glucose the roots were harvested. The extraradical mycelium was extracted from the agar using citrate buffer pH 6 and subsequent filtration, after which it was immediately shock-frozen in liquid nitrogen. Root and fungal samples were freeze dried and subsequently derivatised with 500 µl MeOH containing 3 M HCl (Sigma-Aldrich) at 80°C for 20 hr. MeOH/HCL was removed under a gentle stream of nitrogen and the methyl esters of the fatty acids were solved in 100 µl dry hexane. Gas chromatography mass spectrometry was performed on a GC-QP 2010 plus (Shimadzu, Duisburg, Germany) equipped with a fused silica capillary column (equity TM-5; 30 m by 0.25 mm,0.25-µm film thickness; Supelco, Bellafonte, PA). The mass detector worked in electron ionization (EI) mode at 70 eV. An aliquot of the solution was injected in split mode (1:5) at an injector and interface temperature of 260°C. The column was held at 170°C for 3 min and then developed with a temperature gradient of 2 °C/min to a temperature of 192°C followed by a temperature gradient of 30°C/min to a final temperature of 300°C. Samples were analyzed in SIM mode (m/z values 267 to 288) at least three times. Retention times for fatty acids 16:1ω5 (unlabeled m/z 268) and 16:0 (unlabeled m/z 270) are 12.87 min and 13.20 min, respectively. Data were collected with LabSolution software (Shimadzu, Duisburg, Germany). The overall 13C enrichment and the isotopolog compositions were calculated according to (Lee et al., 1991) and (Ahmed et al., 2014). The software package is open source and can be downloaded by the following link: http://www.tr34.uni-wuerzburg.de/software_developments/isotopo/. Four independent labeling experiments were performed. Overall excess (o.e.) is an average value of 13C atoms incorporated into 16:0/16:1ω5 fatty acids. All statistical analyses (Source code 1) were performed and all boxplots were generated in R (www.r-project.org). At the interface between mycorrhizal fungi and plants: the structural organization of cell wall, plasma membrane and cytoskeleton, The Mycota IX, Heidelberg, Springer Verlag, 10.1007/978-3-662-07334-6_4. Journal of Chromatography A 1217:1543–1548. Plant Signaling & Behavior 7:461–464. The Plant Cell Online 20:1407–1420. Plant Signaling & Behavior 8:e26049. Applied and Environmental Microbiology 61:58–64. The Plant Cell Online 22:2509–2526. AJP: Endocrinology and Metabolism 296:E1183–E1194. The Plant Cell Online 7:359–371. Plant and Cell Physiology 55:928–941. Soil Biology and Biochemistry 34:125–128. Journal of Histochemistry & Cytochemistry 47:1179–1188. In: S Krawets, S Misener, editors. Bioinformatics Methods and Protocols: Methods in Molecular Biology. Totwana: Humana Press. pp. 365–386. Archives of Biochemistry and Biophysics 403:25–34. The Plant Cell Online 24:810–822. Molecular Biology and Evolution 28:2731–2739. Applied and Environmental Microbiology 71:5341–5347. Applied and Environmental Microbiology 69:6762–6767. Applied and Environmental Microbiology 64:5004–5007. Journal of Biological Chemistry 286:7308–7314. The Journal of Biological Chemistry 277:31994–32002. Journal of Lipid Research 52:1039–1054. In: T Munnik, I Heilmann, editors. Plant Lipid Signaling Protocols. Totowa: Humana Press. pp. 69–78. Journal of Clinical Investigation 110:605–609. The Plant Cell Online 22:1483–1497. Thank you for submitting your work entitled "Lipid transfer from plants to arbuscular mycorrhiza fungi" for consideration by eLife. Your article has been reviewed by three peer reviewers, and the evaluation has been overseen by a Reviewing Editor and a Senior Editor. The reviewers have opted to remain anonymous. Our decision has been reached after consultation between the reviewers. Based on these discussions and the individual reviews below, we regret to inform you that the current manuscript will not be considered further for publication in eLife. Please note that we were in principle enthusiastic about the topic of the work. However, the agreement was that extensive revision with significant additional experimentation would be required to address each of the reviewers' comments. Because of our policy to only ask for revision when additional experiments can be accomplished within a reasonable amount of time, we cannot invite revision directly, but would have to consider a seriously revised manuscript as new submission, and thus would not be able to extend our scoop protection, although we would try to provide for an expedited review. We know that this is not the decision you were hoping for and we fully appreciate that you are in a competitive situation, as you indicated in your communications. Hence, this was a difficult decision. As you know, eLife has a consultative evaluation procedure and each of the reviewers took their role very seriously. Unfortunately, as explained above, eLife does not have the option of "major revision", which might have been applicable in your case, and therefore a rejection was the only option available to us. 1) An opinion that the data presented were not compelling with regard to supporting direct lipid transfer from the plant to the fungus, especially with regard to other possible explanations that were not addressed. 2) An opinion that the paper failed to address other important issues of the system, especially regarding published reports dealing with sugar uptake by the fungus (see reviews). 3) An opinion that the paper also failed to discuss other relevant literature related to the genes being examined. The paper reports on the phenotypes of a dis-1 and ram2 mutant of M. truncatula and implicates these genes in providing lipids directly to the AM fungus. 3) Labeling of both M. truncatula and carrot cultures with 13C-glucose results in a lipid profile in the fungus similar to that of the host plant. If we take these in order, evidence 1 is interesting but, of course, was previously reported, although without explanation. Evidence 2, although consistent with the lack of lipid biosynthesis, could also be explained by the reduced colonization and lack of vesicle formation. Therefore, perhaps the most compelling evidence is the 13C labeling experiments, especially using the two hosts. I admit that this evidence is strong but I am not sure it could be considered compelling. Unfortunately, I am not an expert in lipid biosynthesis and, hence, can't properly evaluate this. Clearly, feeding of glucose could lead to additional metabolism resulting in the uptake of 13C by the fungus in a variety of forms. Therefore, it is the similarity of the lipid profiles that provides the strongest evidence. The question is whether the authors could provide any further evidence to strengthen their story. For example, using a M. truncatula mutant that produced a unique lipid profile and demonstration that this uniqueness was reflected in the AM fungus would be very supportive. 1) I found the discussion in the subsection “The KASI family comprises three members in L. japonicus” (Figure 3) related to the phylogenetic relationships of dis-1 to be distracting from the important aspects of the paper. At a minimum, these aspects could be reduced to a few lines in the paper. 2) I was a bit bothered by the use of only colored bar graphs, made very small, to support the important aspects related to relative lipid composition. I would ask the author present comparative tables with actual numbers reflecting the composition of each lipid, including standard error. As a reviewer, we need this type of detail to support the authors’ claims that the plant and fungal lipid profiles are indeed identical. 3) When the ram2 mutant was first isolated, its phenotype was attributed to defects in cutin biosynthesis. This idea was repeated in several papers but is not mentioned in the current paper. I admit that I do not follow this field closely but the authors should address these previous theories concerning ram2 and show how they have now come to other conclusions. This potentially is a very important piece of work. Although I am not familiar with all the techniques and analysis used, the work does seem to have been carried out to an appropriate standard. However, where I thought the manuscript fell down somewhat is in the actual writing. I would encourage the authors to review their manuscript and try and improve its readability making it more accessible to the reader who is not necessarily expert in all the different techniques used. In addition, in several sections the writing becomes quite dense and the authors could do more to improve the general flow of text and to make it more engaging. I do urge the authors to take this point seriously as it will hopefully increase the impact of their results both within the scientific community and beyond. With this in mind the layout of the figures and the figure legends was quite difficult to follow and didn't always appear to support the statements made in the Results text. Perhaps the actual figure appearing under several supplementary figure legend headings – and for the figure to appear on a separate page (not having either page numbers or line numbers) – also doesn't help but I assume this is to comply with the journals instructions). Introduction. I don't believe there is much evidence of the fungus having a different nutrient acquisition than the plant root, therefore 'exploration' is probably a better term than 'mining'. In several places the standard of English could be improved e.g. throughout the Introduction. Define 'FA' at first mention – not latter. Some of the reactions and reaction pathways would be better supported by a supplementary figure to aid the reader. Figure 2 – what arrowheads on Figure 2E, 2F'? Figure 7 – what does 'Overall excess (o.e.) 13C over air concentration' actually mean? Clarify. Results text – feeding plants or just feeding 'roots'? Clarify here. The statement in the Results relating to Figure 7A and B is not actually obvious when reading the legend or checking Figure 7A, B. Please make the legend clearer. Discussion – do all arbuscules turnover in this time period? It is not quite clear what time frame the authors are actually referring to – check the work of Sally Smith for more on arbuscule turnover. Discussion is rather brief, and I was surprised that the work by Helber et al. (see ref below), who identified a fungal hexose transporter in the arbuscule, was not discussed at all. Although this is counter to the proposal suggested here some discussion of this work is surely warranted? Helber N. et al. (2011) A versatile monosaccharide transporter that operates in the arbuscular mycorrhizal fungus Glomus sp is crucial for the symbiotic relationship with plants. The Plant Cell, 23: 3812-3823. Materials and methods – do not start a new sentence with a number ('19'). In this manuscript, Gutjahr and coworkers investigated the possible lipid transfer from host plants to their arbuscular mycorrhizal fungal symbionts. 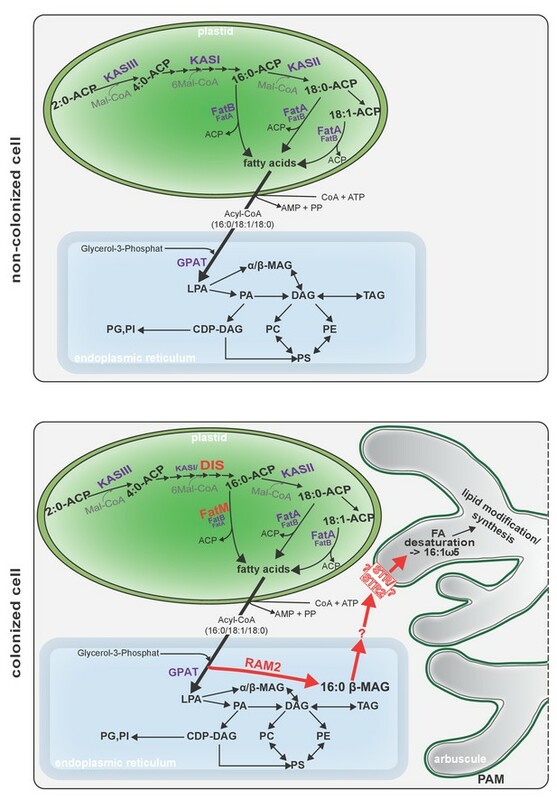 Based on two mutants impaired in two steps of lipid biosynthesis, previously shown to be defective in arbuscule formation, the authors established the hypothesis that lipid transfer is key for fungal growth and maintenance of the symbiosis. To substantiate this hypothesis, the lipid profile of colonized plants (WT and mutants), as well as the lipid profile of fungal mycelium colonizing such plants were investigated. The topicality of the article is that while sugar transfer to the fungus has been demonstrated by biochemical experiments, and sugar uptake into the fungus molecularly shown, the possibility that in addition lipid transfer might be also crucial has been less explored. However, here is where the novelty of the paper is compromised because similar findings (even one of the mutants is the same but in another model legume) has been just accepted for publication and will appear online soon. Furthermore, two of the coauthors of that article also are co-authors here, and thus it is surprising that no more coordination has been attempted. But besides that, my main criticism is the overinterpretation of the results, shown with two biosynthesis mutants and not transport mutants, that lipid transfer is what essentially fuels fungal growth. In my opinion, lipid transfer is not convincingly demonstrated here, and thus the argumentation leads to overstatements (see below). 1) Both mutants displayed a reduced fungal colonization, still the fungus was able to develop intraradical hyphae, and the main phenotype was distorted by arbuscules. Because the fungus is unable to feed until its in planta phase, how is the fungus nourished up to the point of arbuscule formation? Their results rather indicate that plant lipids (if transferred) could be critical for fungal plasma membrane development at arbuscules where the fungus rapidly and profusely grows by dichotomous branching. This would be in line with their results showing complementation when using the arbuscule-specific promoter PT4. Furthermore, they argue that lipid transfer might take place during arbuscule degeneration, which is inconsistent with the involvement of the other players such as the STR transporters, putative exporters of plant lipids, shown to localize in fully functional arbuscules. 2) The originality of their work lies on the transfer of the lipids from the plant to the fungus. And while I have little doubt that this is likely the case, in my opinion the authors failed to demonstrate that convincingly. In the key Figure 7B, the isotopolog profile of extraradical mycelium from mutant plants shows a reduced amount of 16:1w5 (the typical mycorrhizal FA) as compared to WT plants. This is not surprising giving that a much lower colonization is observed in those plants and results are given as enrichment and not per amount of mycelium, and its synthesis has been shown to happen within colonized roots. But if this lipid can be only synthesized after transfer of monoacylglycerols to the fungus, why is there at all in the roots of mutants and in the connected extraradical hyphae? And furthermore, why its concentration is even significantly higher than in hyphae grown in the absence of a labelled plant? If no lipid transfer was taking place, there should be no labelled 16:1w5 in the hyphal samples from mutant plants at all. Thank you for submitting your article "Lipid transfer from plants to arbuscular mycorrhiza fungi" for consideration by eLife. Your article has been reviewed by three peer reviewers, and the evaluation has been overseen by a Senior Editor and Reviewing Editor. The following individual involved in review of your submission has agreed to reveal her identity: Alga Zuccaro (Reviewer #3). This manuscript reports the surprising discovery that not only sugars, but also lipids are transferred from plants to symbiotic fungi. We found the isotope labeling experiment very impressive, convincing us that in dis, ram2 and str mutants the fungal profiles do not align with the host profile, in contrast to the wild type, were both align very well. This strongly supports the hypothesis that fatty acids synthesized in the plants through this pathway are transferred to the fungus. In absence of a protein that has been directly shown to transport fatty acids from plant to fungus (although STR is a good candidate), this is the strongest evidence pointing to transfer of lipids that are generated through DIS and RAM2. We would, however, ask the authors to add a sentence that they cannot exclude at this point that STR effects on lipid transport are indirect (although we agree that the common regulation of RAM2 and STR by RAM1 make for an exciting hypothesis in this direction, direct regulation of STR by RAM1 does not seem to have been shown). We have read the previous reviewers' comments and the authors' replies and felt that they were sufficiently addressed. The new Figure panels 8D and 9 surely help to follow the rationale behind the experiments and are welcome in this new version. An attractive genetic experiment for the future would be to constitutively express DIS and RAM2 in an str background, in order to assess a tissue that is full of the right lipids but presumably would still be unable to feed the fungi. If data from such an experiment are already at hand, please include them. One question relates to a point raised by previous reviewer 3 and the authors' reply that membrane formation during initial colonization is supported by vesicles. Would a photosynthetic nurse plant be able to provide the lipids for vesicle formation and thus lipids that could be sourced to form new arbuscules (as pointed out before)? Please discuss. We also were not comfortable with the conclusion that the transcript accumulation of KASIII and DIS "depends" on RAM1. This could also be a rather indirect effect, of reduced fungal mass in ram1 mutants. Please change the title of Figure 6 to something like "Loss of RAM1 affects AM-specific induction of KASIII and DIS", and in 6A e.g. "RAM1 effects on AM-specific induction of KASIII and DIS and 16:0 FA biosynthesis, and absence of effects on KASII". Our work has been performed in Lotus japonicus and not in Medicago truncatula. The mutant is called dis (dis-1 is the first allele, we identified by mapping and NGS analysis). There is nothing particularly unique about the dis-1 mutant, although it appears to be a new gene involved in the AM symbiosis. DIS is a new gene in AM symbiosis and dis is a novel mutant. We do not understand what the reviewer means with “not particularly unique” and how we can address this issue. Ram2 had been reported previously by a number of labs and the AM phenotype reported, although clearly not related directly to the notion of lipid transfer. We are not sure what the reviewer means with “number of labs”. Maybe the reviewer was thinking about RAM1, which has indeed been reported by a number of labs. At the time of first submission (full submission 30. 01. 2017) an AM phenotype for ram2 mutants had been reported by only one single publication: Wang et al. 2012, Current Biology. This publication describes a reduction in fungal hyphopodia as main ram2 phenotype. In addition, a defect in arbuscule branching was mentioned. The authors proposed that the hyphopodia phenotype was due to a lack of cutin monomers at the root surface. However, a very recent publication from Maria Harrison’s lab (Bravo et al. 2017) could not confirm the hyphopodia phenotype with the identical Medicago mutant. Similar to us, they found that ram2 mutants are perturbed in arbuscule formation only. We have shown that ram2 mutants can be transgenically complemented when RAM2 is driven by an arbuscule-cell-specific promoter (Figure 2). Therefore, it is very unlikely that RAM2 functions in promoting hyphopodium formation – at least under the growth conditions of our lab and Maria Harrison’s lab (Bravo et al. 2017). The isotopolog profile of 16:0 FA in the extraradical fungal mycelium exactly mirrors the isotopolog profile of 16:0 FA Lotus japonicus roots. Carrot hairy roots produce a different isotopolog profile than Lotus. Also the carrot profile is mirrored in the extraradical fungal mycelium. This is compelling evidence, that the plant dominates the FA profile of the fungus. The result can only be explained by transfer of 16:0 FA from the plant to the fungus. To make this more understandable we have now better explained the isotopolog profiling experiment in the manuscript text. We also added a figure, which schematically illustrates the carbon flow in the experimental setup. Furthermore, we have performed the transfer experiment with an additional mutant, which is defective in the ABCG transporter STR. The results are the same as for the dis and ram2 mutant. This transporter is a good hypothetical candidate for transferring lipids across the periarbuscular membrane towards the arbuscule. We agree with the reviewer and have reduced this part. In the previous full submission we had uploaded an excel file with the raw data. Was this not available to the reviewer? The isotopolog pattern is in our view more easily understandable if displayed as colored graphs instead of tables. This way of displaying the data is standard practice in metabolic flux studies. We presented biological replicates separately instead of calculating means, to display the similarity of the isotopologue pattern between root and extraradical mycelium for every single sample. Independent of the similarity, we consider it more transparent, when results for each sample are displayed and we agree with the advice of Weissgerber et al. 2015, Plos Biol. We only used bar charts for the very complex lipidomics data because with a display of single sample data points it would be too hard “to see the forest for the trees”. In Lotus japonicus we cannot reproduce the ram2 phenotype described in Wang et al. 2012, Current Biology. In the meantime it has been published (Bravo et al. 2017) that there is no hyphopodia phenotype in the same Medicago ram2 mutant used in Wang et al. 2012. Therefore, we do not see the necessity anymore to discuss this discrepancy in detail. We agree with the reviewer and have re-written the manuscript substantially to make it more accessible. We have also added a model (Figure 9) explaining how lipid biosynthesis is re-directed when a root cortex cell becomes colonized by an AM fungus and a model explaining the carbon fluxes in the isotopolog profiling experiment (Figure 8). We have added page numbers. The format of the supplementary figure heading was meant to comply with the article format of eLife. Results text – feeding plants or just feeding 'roots'. Clarify here. We thank the reviewer for these comments, which helped us improve the manuscript. We agree with all requests above and adjusted the text accordingly. We have substantially re-written the Discussion and deleted the ideas about arbuscule turnover. We agree that there is strong evidence for hexose transfer from plant to fungus for example from the Shachar-Hill and Pfeffer labs (but also from others). We have included Helber et al. 2011 in the Introduction. We have also included a sentence to the Discussion stating that it will now be interesting to determine the relative contributions of sugars and lipids to fungal C-nutrition. In this manuscript, Gutjahr and coworkers investigated the possible lipid transfer from host plants to their arbuscular mycorrhizal fungal symbionts. Based on two mutants impaired in two steps of lipid biosynthesis, previously shown to be defective in arbuscule formation. We would like to point out that these mutants were found by a forward genetics screen, and their microscopic arbuscule phenotype was described previously (Groth et al. 2013, Plant J). However, the identification of the mutations is novel. The authors established the hypothesis that lipid transfer is key for fungal growth and maintenance of the symbiosis. To substantiate this hypothesis, the lipid profile of colonized plants (WT and mutants), as well as the lipid profile of fungal mycelium colonizing such plants were investigated. We investigated the isotopolog profile of fungal mycelium specifically of 16:0 FA and 16:1ω5 FA as markers for lipid transfer (16:0 FA) and fungus specific FA accumulation (16:1ω5 FA). We did not investigate the entire lipid profile of the extraradical mycelium. The topicality of the article is that while sugar transfer to the fungus has been demonstrated by biochemical experiments, and sugar uptake into the fungus molecularly shown, the possibility that in addition lipid transfer might be also crucial has been less explored. However, here is where the novelty of the paper is compromised because similar findings (even one of the mutants is the same but in another model legume) has been just accepted for publication and will appear online soon. Furthermore, two of the coauthors of that article also are co-authors here, and thus it is surprising that no more coordination has been attempted. In our article we describe the identification of the mutations in two mutants that were found in a forward genetics screen. This lead to the discovery of the novel gene DIS, and the identification of a ram2 mutant in Lotus japonicus. Furthermore, we provide strong experimental evidence for lipid transfer from plants to fungi by feeding plants with stable isotope labelled glucose followed by isotopolog profiling of fatty acid profiles in plant and fungus. At the time of submission, there was no published article with similar findings (full submission 30.01.2017) and the corresponding author of this manuscript had no information about the status of other manuscripts or articles. We suspect that the reviewer means the article by Bravo et al. 2017, which has in the meantime been published in New Phytologist (acceptance date: 16.02.2017, first published 05.04.2017). This article contains an improved and detailed side-by-side phenotypic description and lipid quantification of previously published fatm, ram2 and str mutants of Medicago truncatula. However, the article does not contain any experiment, which examines lipid transfer from plants to AM fungi. Furthermore, it does not report on a novel gene. We have cited the article in the new version of our manuscript. But besides that, my main criticism is the overinterpretation of the results, shown with two biosynthesis mutants and not transport mutants, that lipid transfer is what essentially fuels fungal growth. In my opinion, lipid transfer is not convincingly demonstrated here, and thus the argumentation leads to overstatements (see below). In the new version of the manuscript we have included lipid transfer measurement (by isotopolog profiling) also for the str mutant. This mutant is defective in an ABC transporter gene. STR localizes to the periarbuscular membrane and is hypothesized to transport lipids out of the plant cell towards the arbuscule. 1) Both mutants displayed a reduced fungal colonization, still the fungus was able to develop intraradical hyphae, and the main phenotype was distorted by arbuscules. Because the fungus is unable to feed until its in planta phase, how is the fungus nourished up to the point of arbuscule formation? Their results rather indicate that plant lipids (if transferred) could be critical for fungal plasma membrane development at arbuscules where the fungus rapidly and profusely grows by dichotomous branching. This would be in line with their results showing complementation when using the arbuscule-specific promoter PT4. A function in PAM synthesis is not indicated by our current results. We agree that lipids produced in arbuscule-containing cells may be used for several purposes including PAM construction and have added a sentence explaining this to the Discussion. Furthermore, they argue that lipid transfer might take place during arbuscule degeneration, which is inconsistent with the involvement of the other players such as the STR transporters, putative exporters of plant lipids, shown to localize in fully functional arbuscules. Although, arbuscule collapse would act at a later and thus different stage of lipid transfer than STR, we have deleted this argument from the Discussion. Instead, we now provide data that FAs are not transferred from str mutants to AM fungi (Figure 8—figure supplement 2). We have also added a paragraph on the hypothetical role of STR to the Discussion. Although Figure 7B (now Figure 8B) is very important, we disagree that it is the key figure. The key figure is Figure 7C (now Figure 8C) showing an extreme similarity of FA isotopolog profiles between WT roots (Lotus and carrot) and the fungal extraradical mycelium. This can only be explained by direct FA transfer (in whichever lipid form) from plant to fungus. It is possible that ß-monoacylglycerols are the transferred lipid and we have discussed this in detail in the Discussion section. However, we would like to point out that it has not been clearly shown. Nevertheless, we have now quantified MAGs in all mutants and wild-type roots and added the data to the manuscript (Figure 7). We think that the extremely low amount of 13C labelled FAs appearing in the fungus when it is connected with dis, ram2 or str mutants has most likely been synthesized by housekeeping KASI and GPAT6. We agree and added a sentence to the Discussion. We agree that the proposed experiment would be very interesting. We did not yet attempt to constitutively express DIS and RAM2 in the str background. However, we tried whether constitutive expression of DIS and RAM2 and a combination of both under the control of a strong ubiquitin promoter in the wild-type could enhance root colonization. 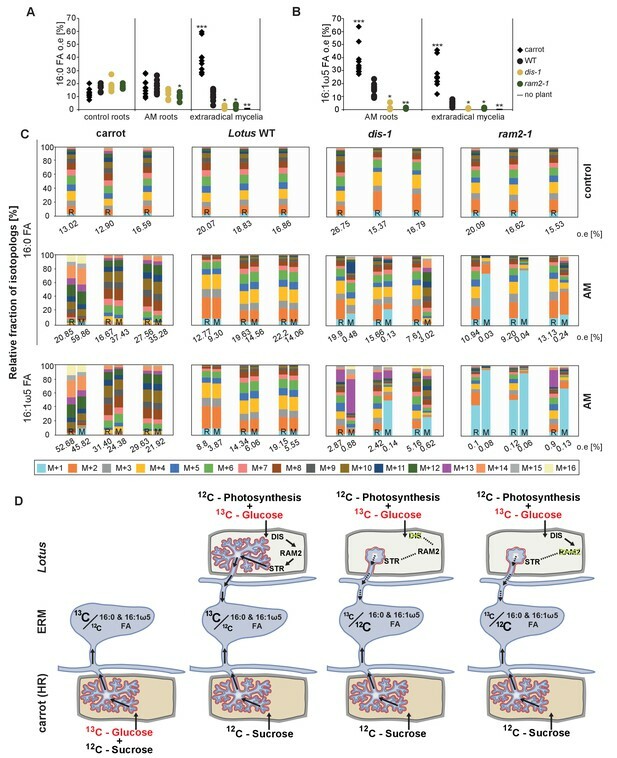 In two independent experiments, we could neither detect enhanced transcript accumulation of DIS and RAM2 (normalized to Ubiquitin10 transcript accumulation) nor enhanced root length colonization. Therefore, we suspect that increased transcript accumulation of DIS and RAM2 may be difficult to achieve in L. japonicus hairy roots. The approach works per se because in a previous study we observed that RAM1 transcript accumulation was strongly increased in colonized wild-type roots, when the roots were transformed with a RAM1 fused to the very same ubiquitin promoter (see Pimprikar et al. 2016, Figure S3). Please see the results from one of the two experiments below. 1) Our dis-1 and ram2-1 mutants have been found based on their stunted arbuscule phenotype in a forward genetic screen in which the inoculum was provided by photosynthetic chive nurse plants (Groth et al. 2013). 2) We performed co-segregation analyses for mapping the mutations with segregating populations grown in the same pot, therefore, the wild-type and heterozygeous siblings acted as photosynthetic nurse plants on the mutants. In these conditions the stunted arbuscule phenotype was very easily detectable. 3) Arbuscule branching was not restored in a rice str mutant when grown in the presence of wild-type nurse plants (Gutjahr et al. 2012). 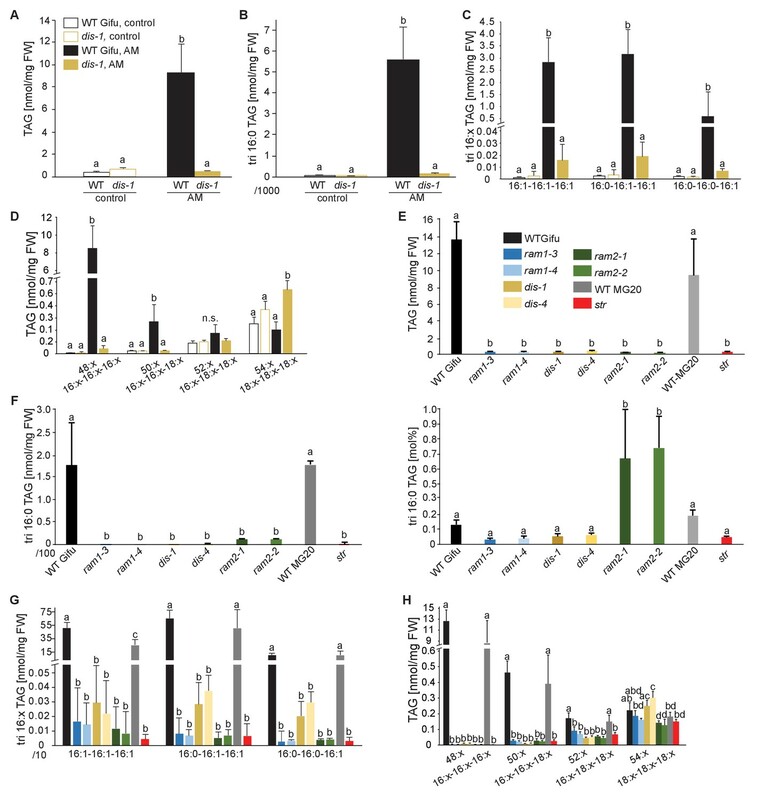 However, we agree that photosynthetic nurse plants support a higher level of colonization in the lipid biosynthesis and str mutants (see also Gutjahr et al. 2012) and that nurse plants can also support the formation of low amounts of lipid-containing vesicles (see ram2 mutant in our new Figure 8—figure supplement 1C). We modified Figure 6 legend according to the reviewer’s suggestions and also adjusted the corresponding Results section. Hans Fischer Gesellschaft e. V.
We are grateful to Tomoko Kojima (NARO, Tochigi, Japan) for providing Lotus japonicus str mutant seeds and to LotusBase for providing LORE1 insertion lines. We thank Julia Mayer for help with setting up carrot hairy root systems, Samy Carbonnel, David Chiasson, Michael Paries and José Antonio Villaécija-Aguilar for contributing a golden gate module. © 2017, Keymer et al.